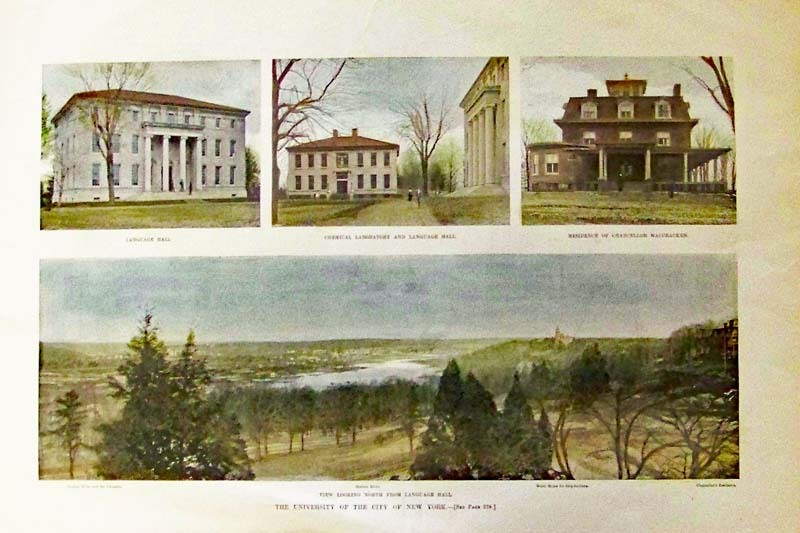 AMHERST COLLEGE, MA. 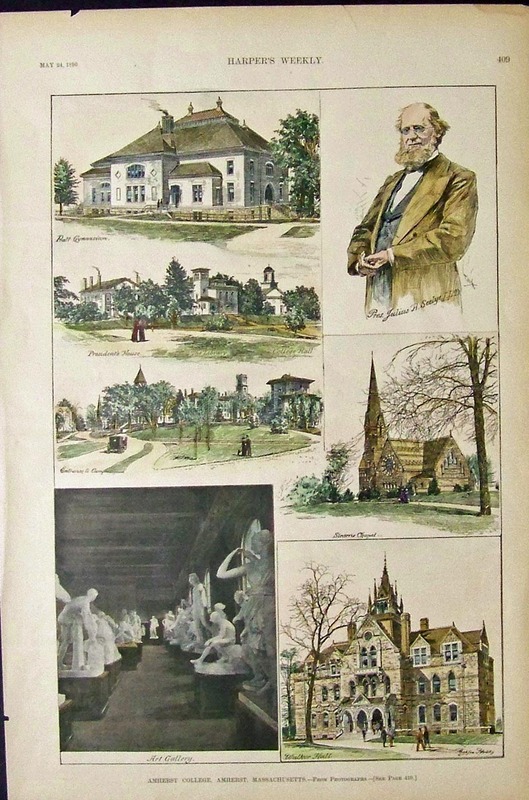 Two hand colored prints. 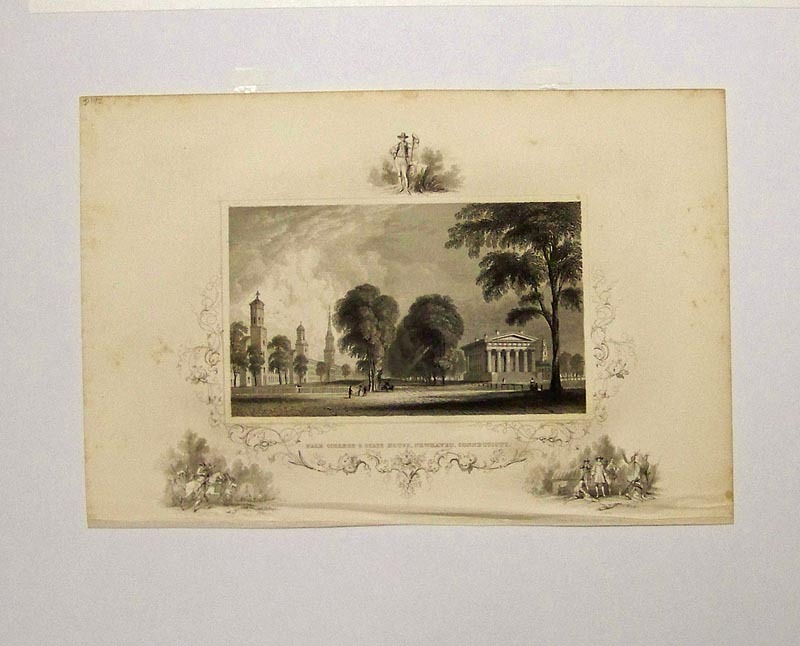 AMHERST COLLEGE, MA. 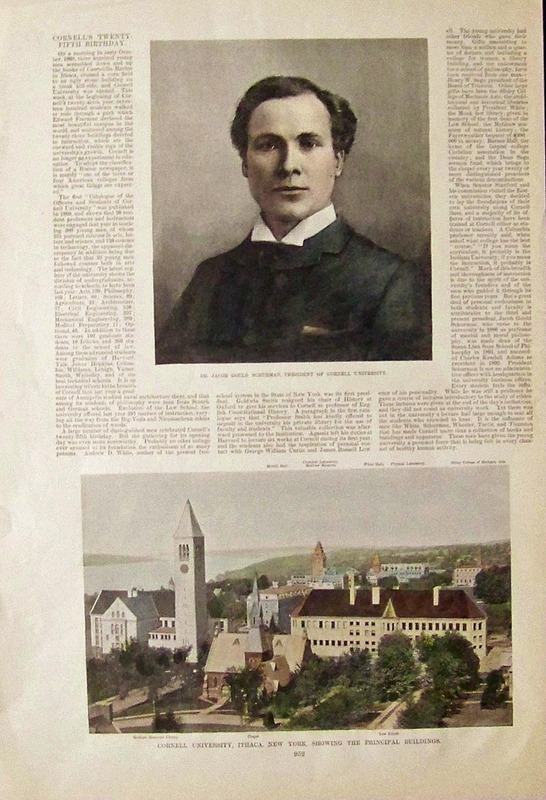 1890. 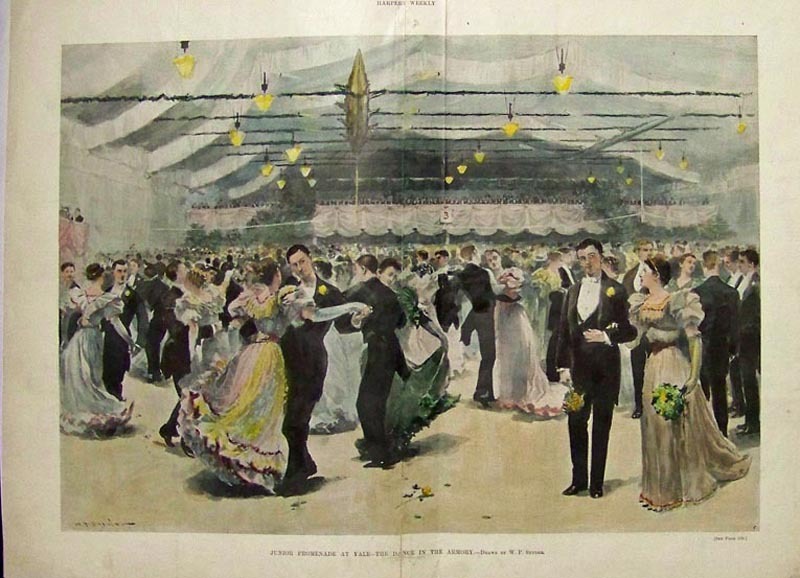 Hand colored. 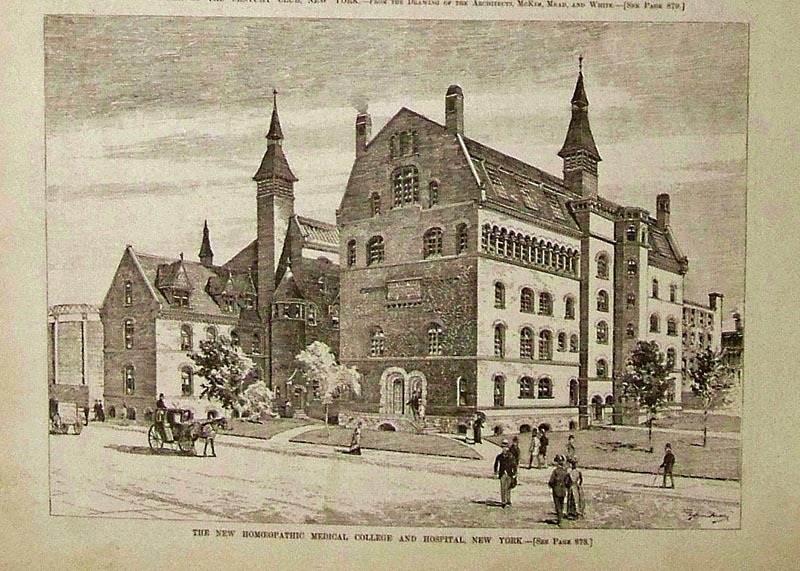 COLUMBIA COLLEGE, NY - Bird's-eye View from 49th Street looking North. 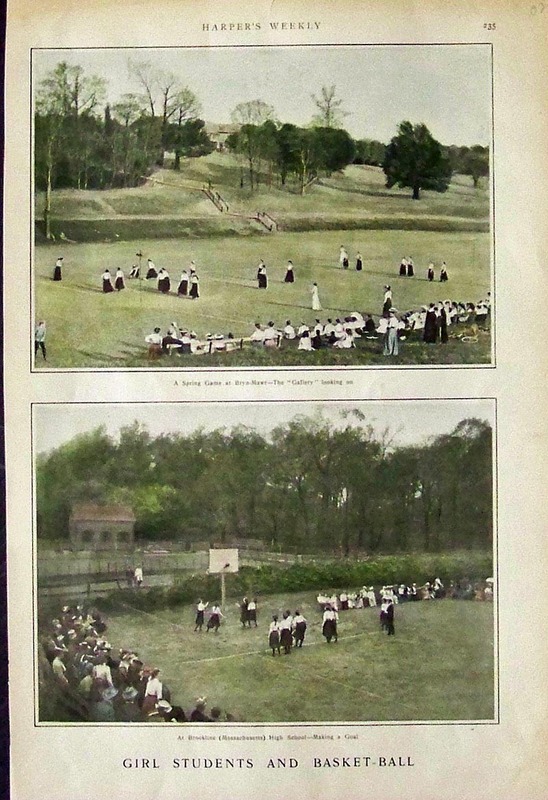 BRYN-MAWR COLLEGE AND BROOKLINE WOMEN'S COLLEGE PLAYING BASKETBALL. 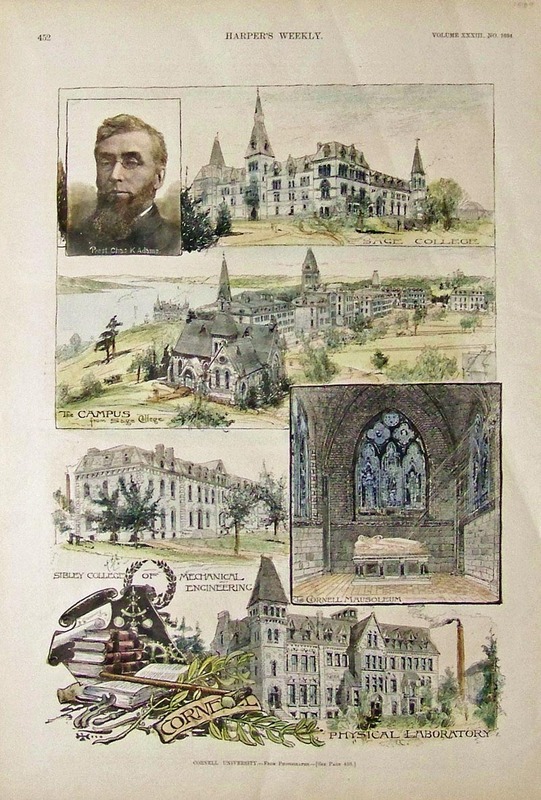 CATHOLIC UNIVERSITY AT WASHINGTON, D.C. 1889 Hand colored half-page engraving. 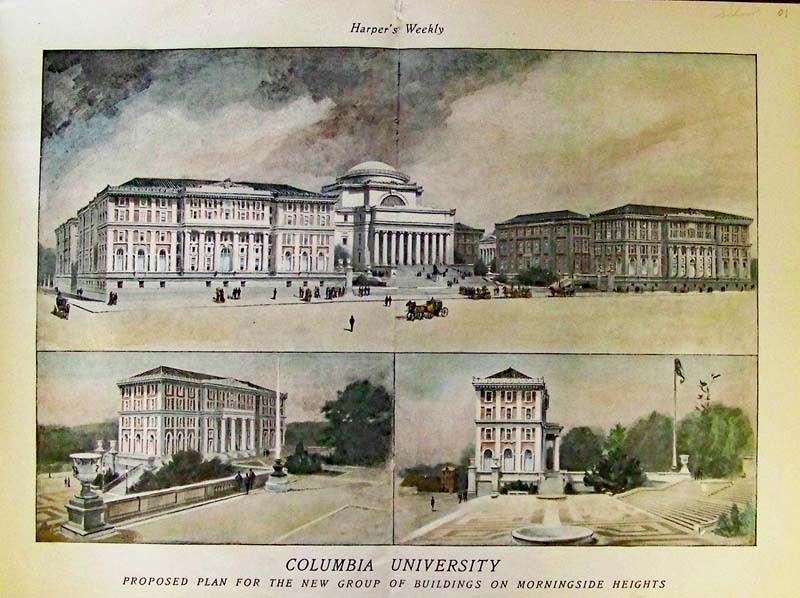 COLUMBIA UNIVERSITY, NY - Proposed Plan for new buildings. 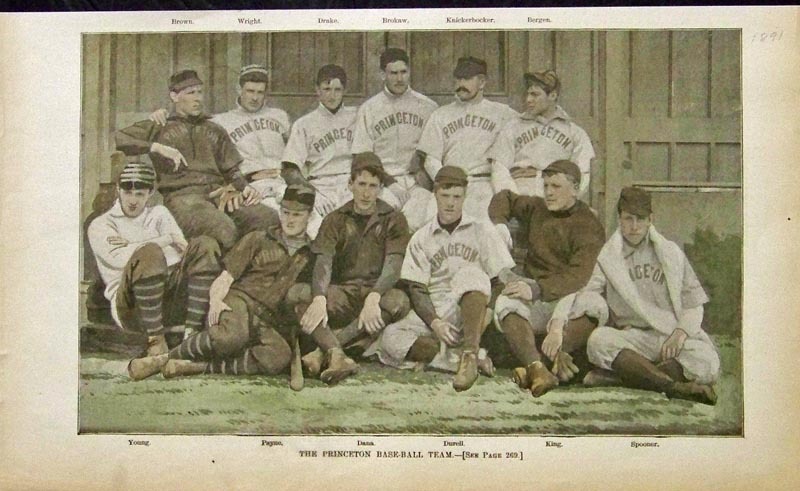 1899 Hand colored half-tones. 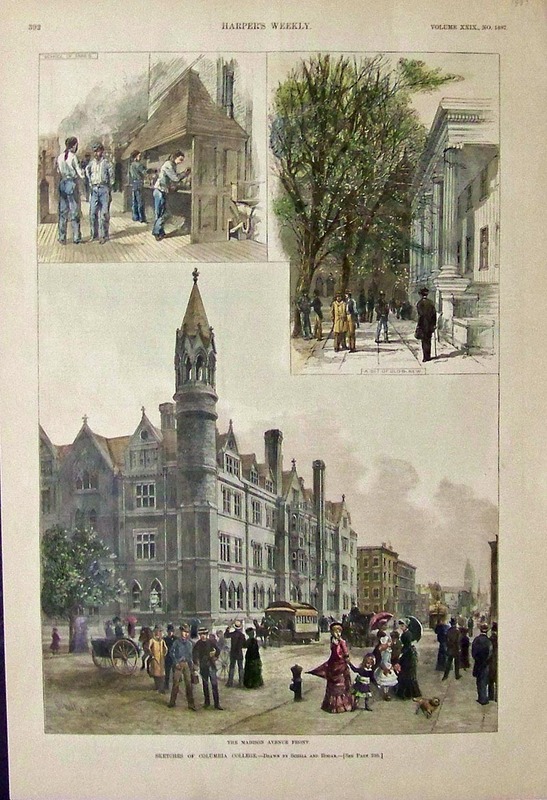 COLUMBIA UNIVERSITY, NY - 1878 hand colored engraving. 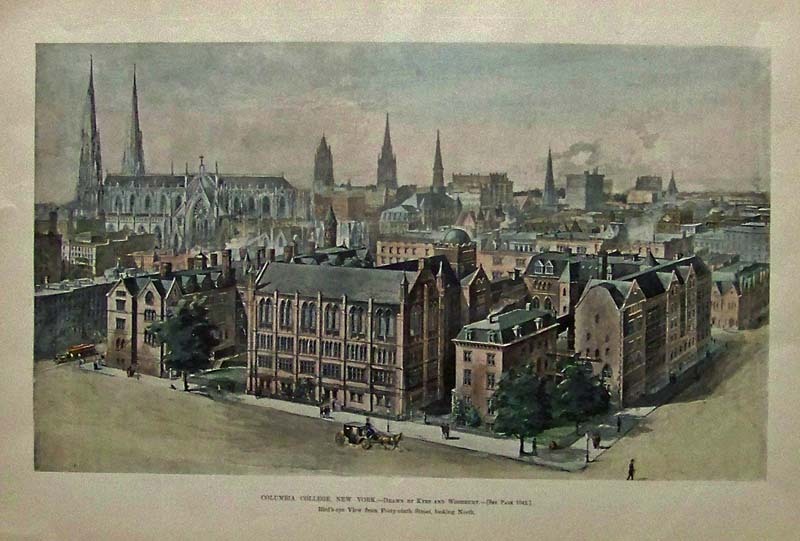 COLUMBIA UNIVERSITY, NY - 1887 Hand colored engraving. 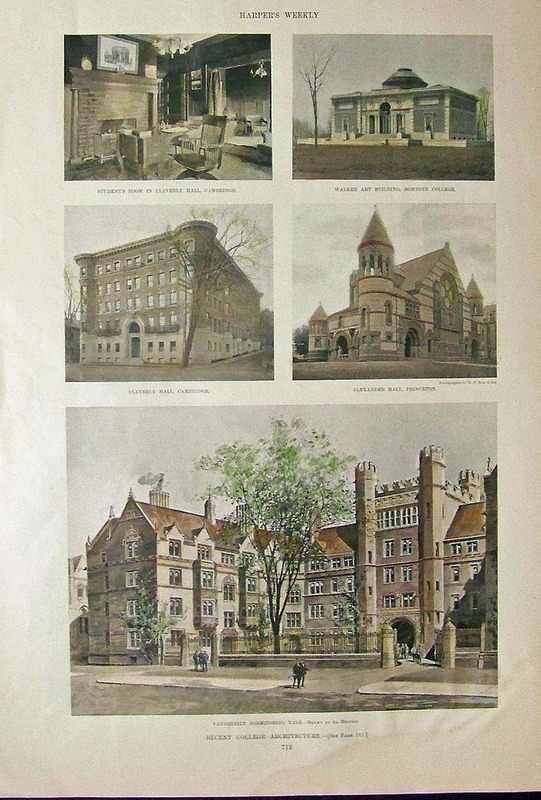 COLUMBIA UNIVERSITY, NY - 1895 Hand colored engraving. 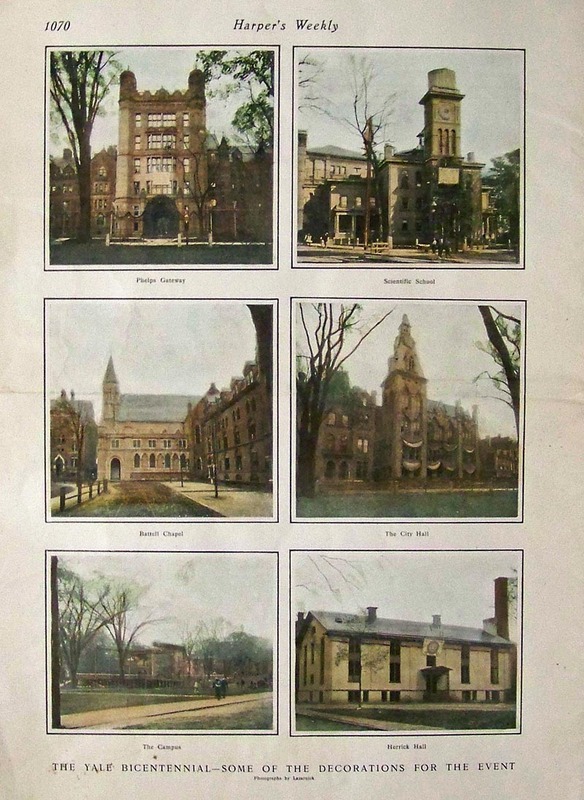 COLUMBIA UNIVERSITY, NY - Hand colored half-tone showing Hall of Fame at University Heights, NY. 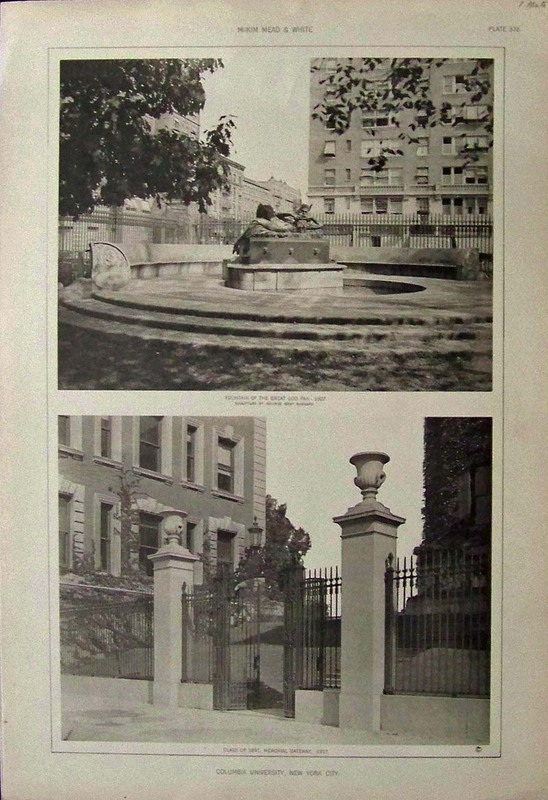 COLUMBIA COLLEGE, NY -- C.1917 Half-tone images of the Fountain of the Great God Pan - 1907; and the Memorial gateway for Class of 1891. 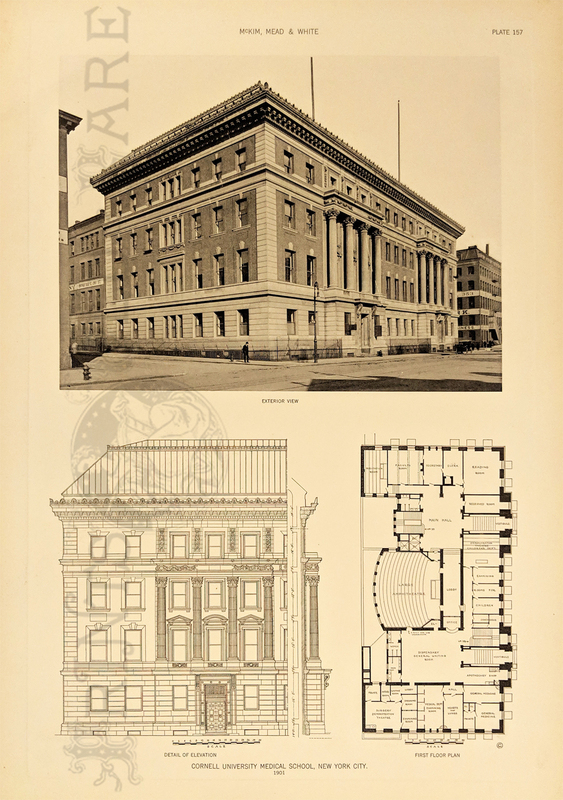 Featured in McKim Mead & White. 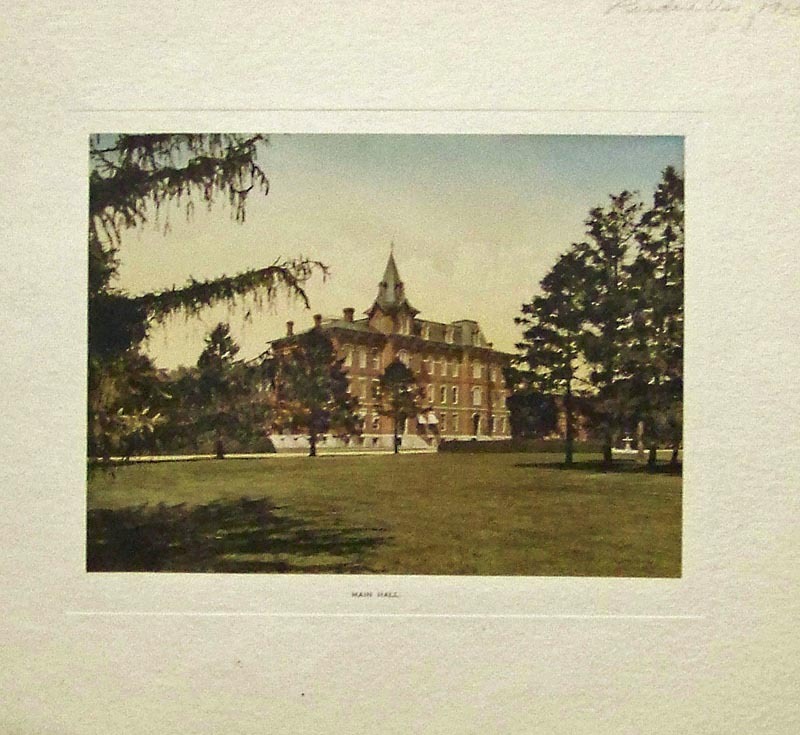 CORNELL UNIVERSITY, ITHACA, NY - 1869 Hand colored half-tone. 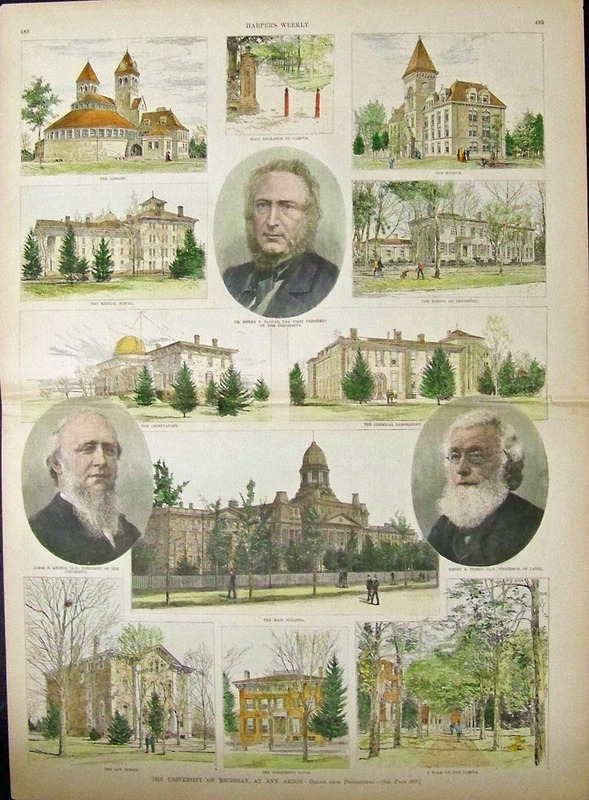 CORNELL UNIVERSITY, ITHACA, NY - 1873 Hand colored engraving. 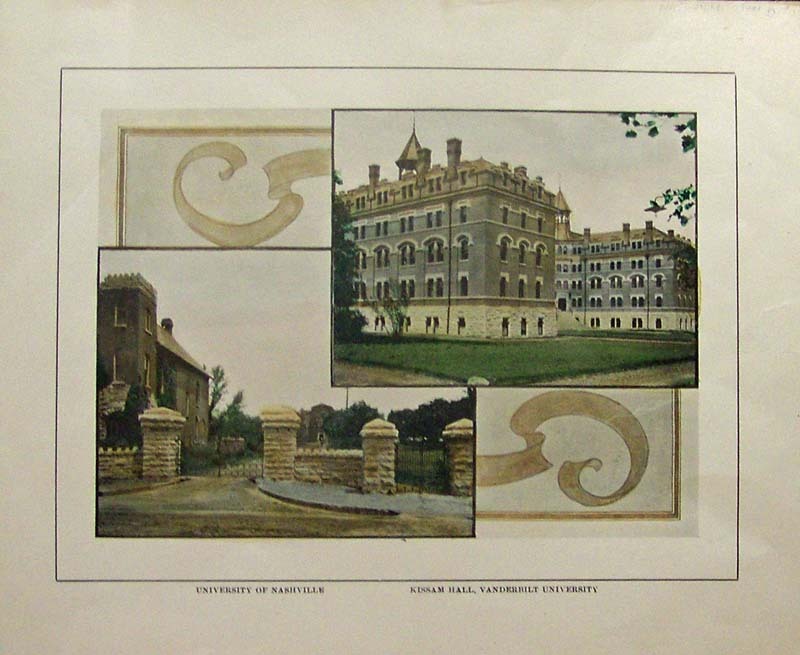 CORNELL UNIVERSITY, ITHACA, NY - 1889 Hand colored engraving. 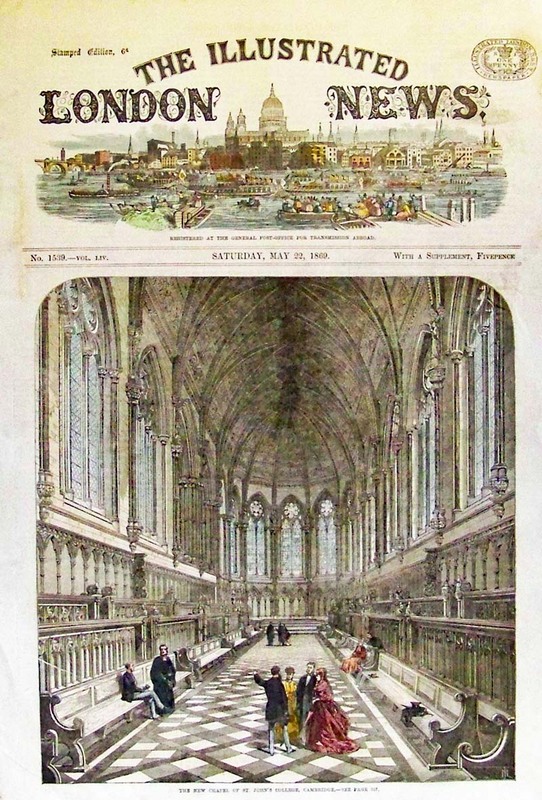 ST. JOHN'S COLLEGE, CAMBRIDGE - 1869 Illustrated London News hand colored wood engraving. 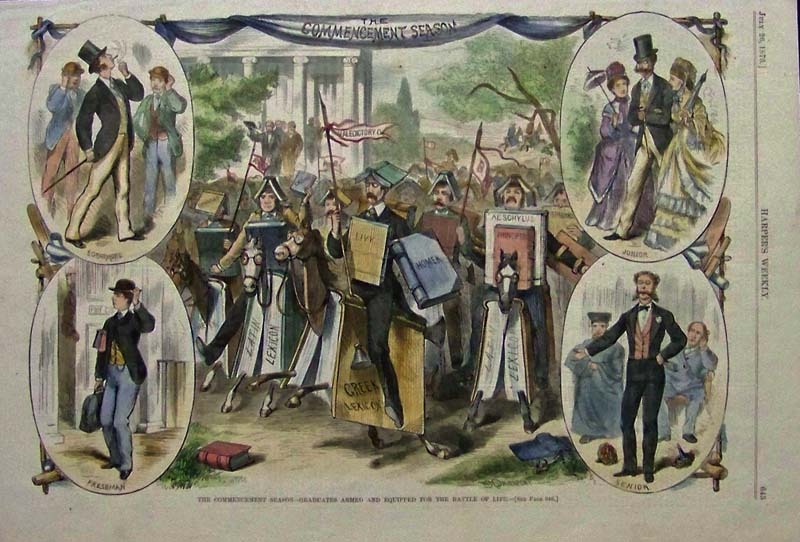 1873 COMMENCEMENT SEASON - Hand colored wood engraving showing graduates armed and equipped for the Battle of life. 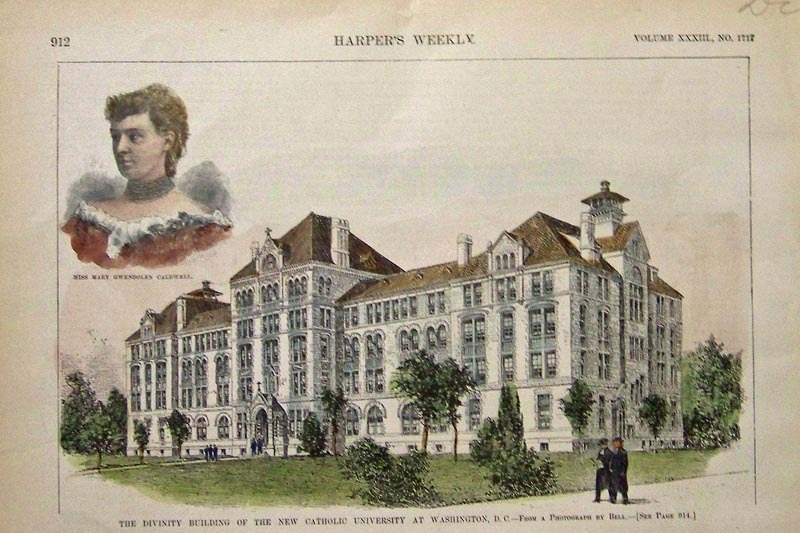 Harper's Weekly. 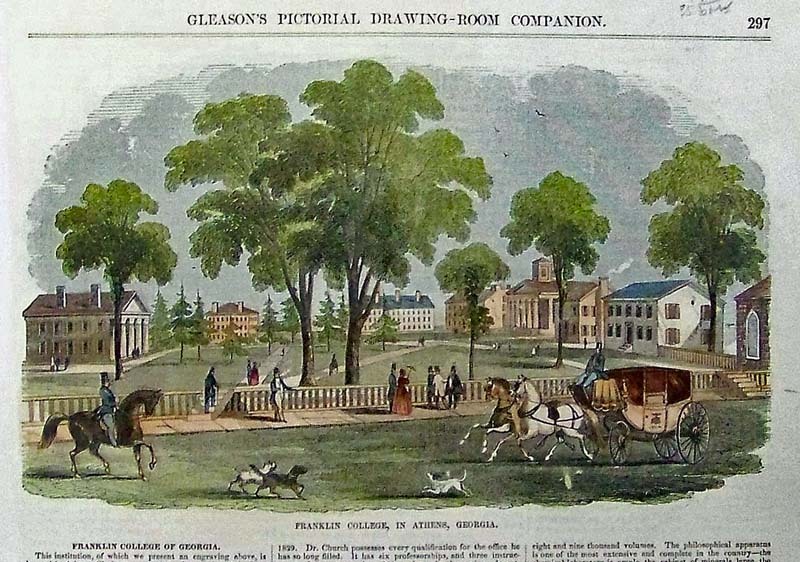 1854 FRANKLIN COLLEGE, ATHENS, GA - Hand colored wood engraving from Gleason's Pictorial Drawing-Room Companion. 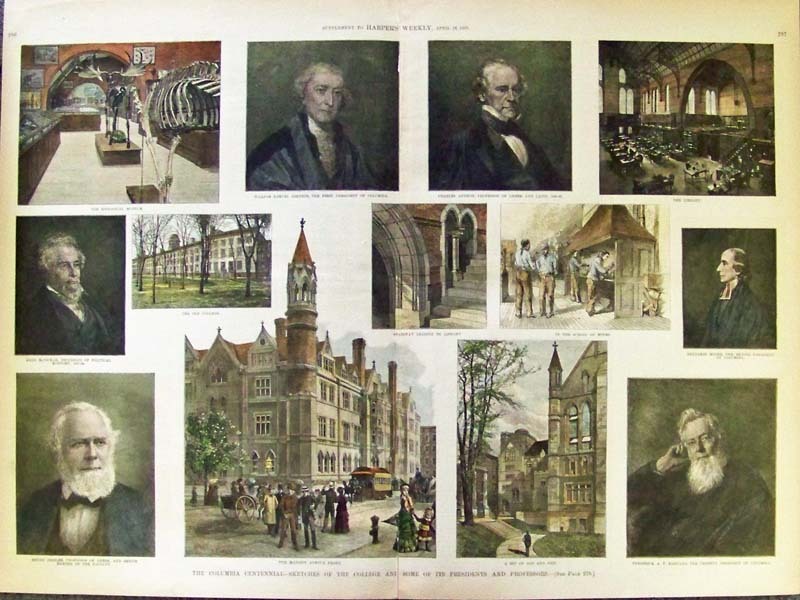 1887 THE COLUMBIA CENTENNIAL - Sketches of the College and some of its Presidents and Professors. 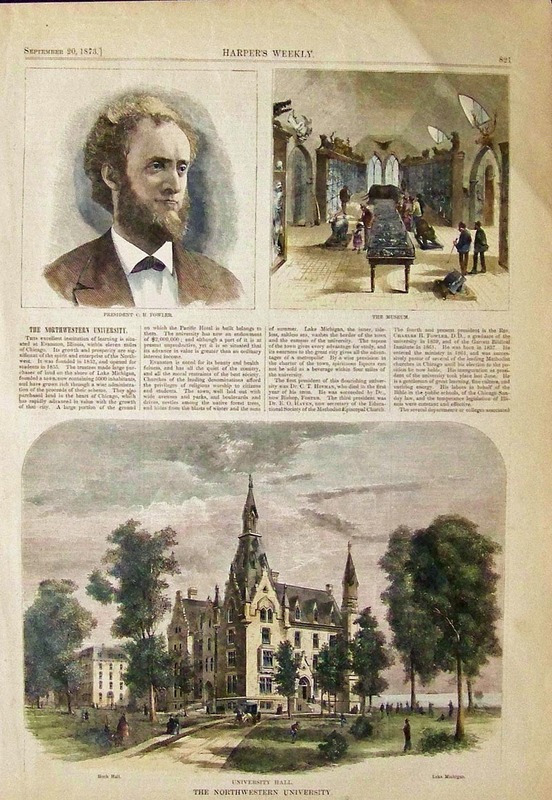 Harper's Weekly hand colored wood engravings. 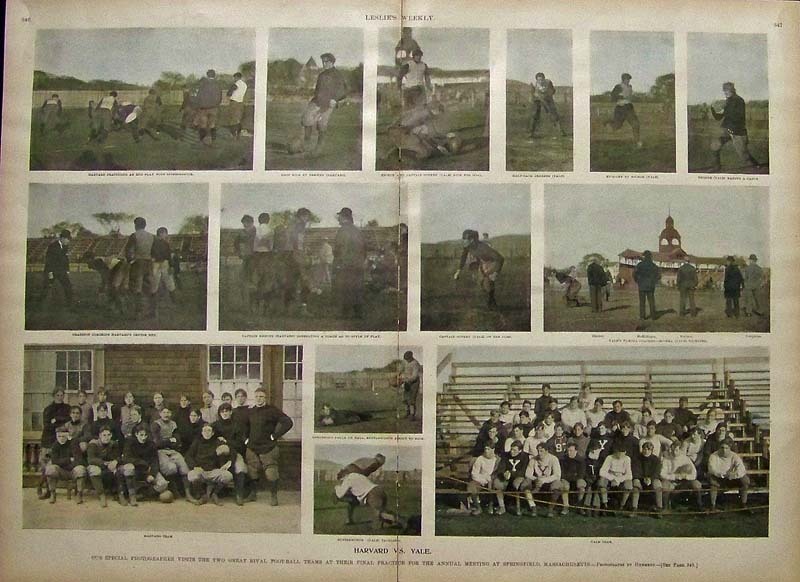 1894 Hand colored half-tone images of Harvard vs. Yale football players with the game being played in Springfield, Massachusetts. 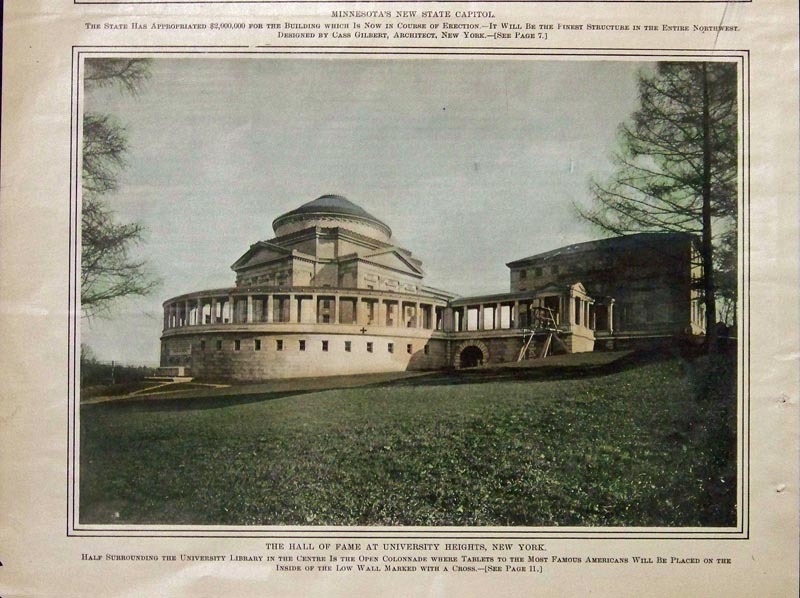 Featured in Leslie's Weekly. 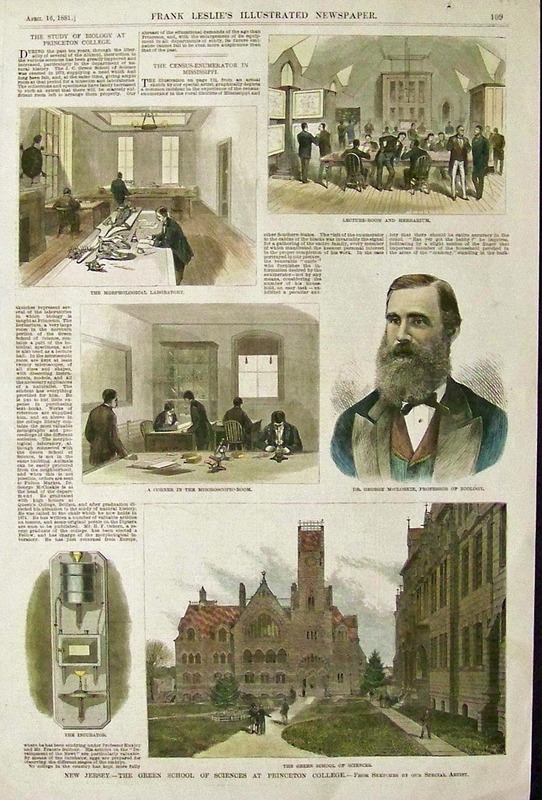 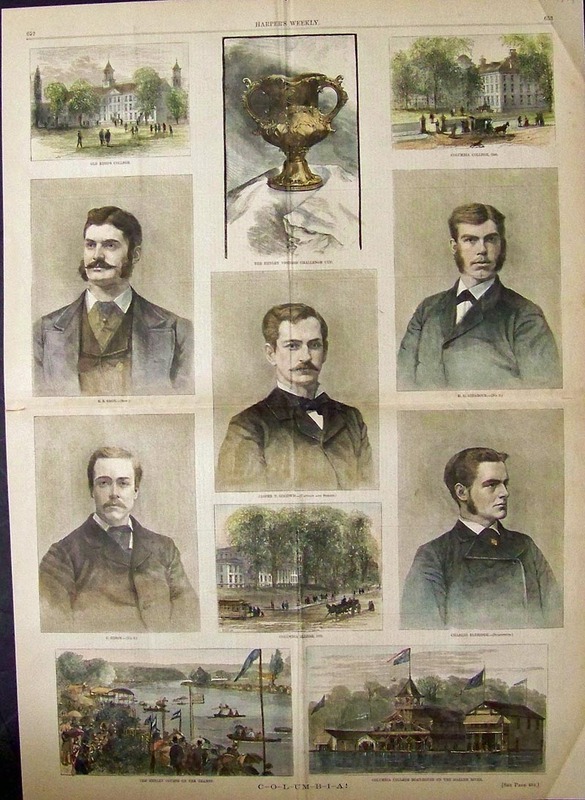 1889 HOMEOPATHIC MEDICAL COLLEGE AND HOSPITAL, NEW YORK - Harper'sd Weekly wood engraving. 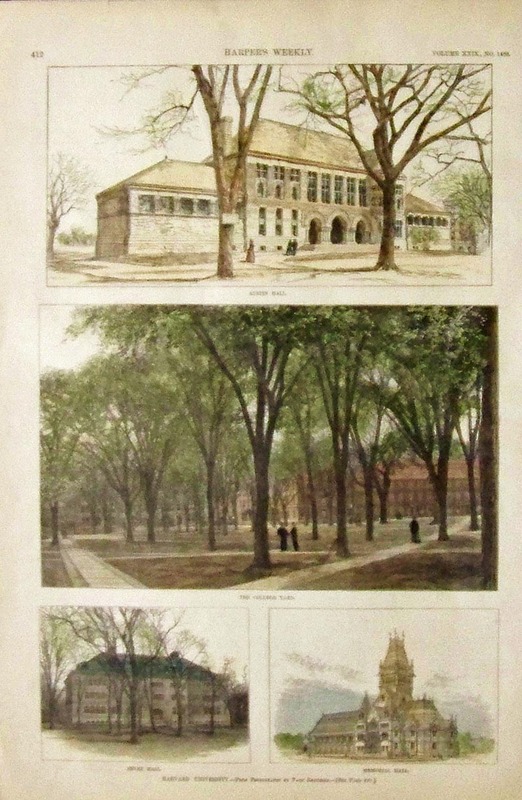 HARVARD UNIVERSITY, CAMBRIDGE, MA - 1889 Hand colored engraving. 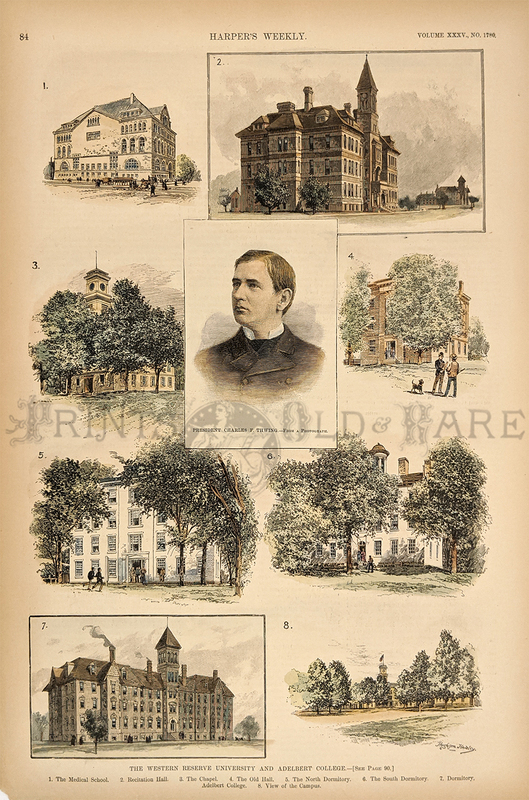 HARVARD UNIVERSITY, CAMBRIDGE, MA - 1883 Hand colored engraving. 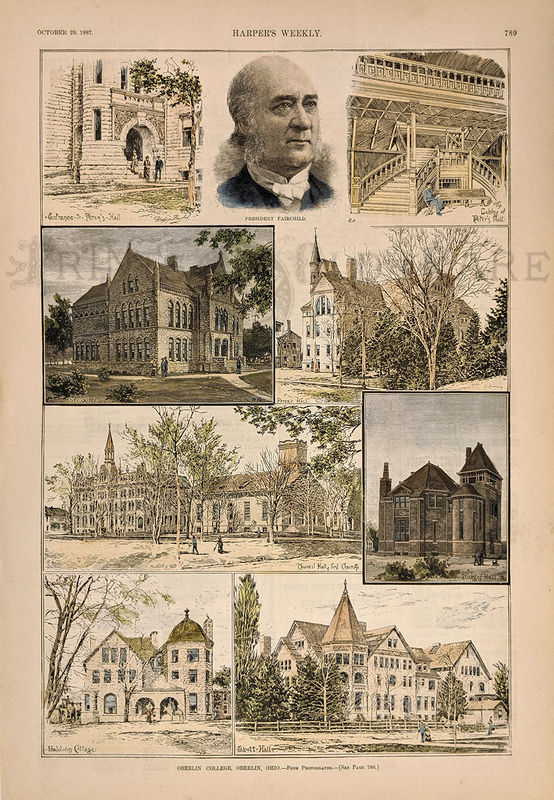 HARVARD UNIVERSITY, CAMBRIDGE, MA - 1887 Hand colored engraving. 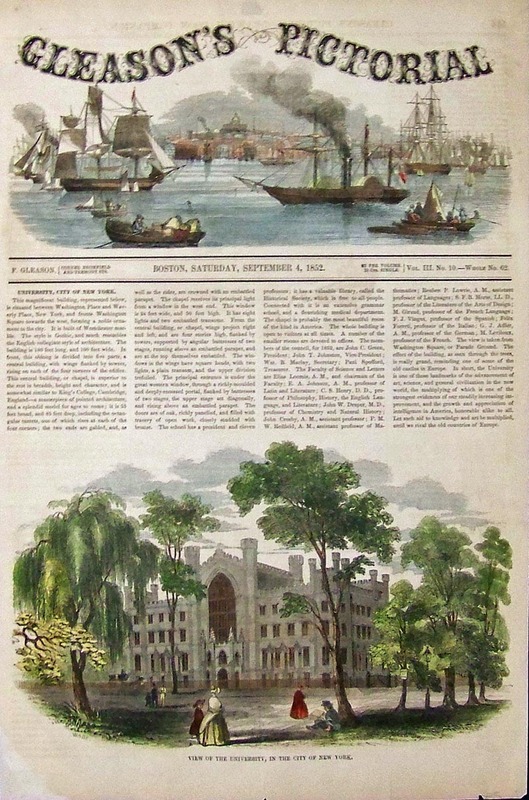 HARVARD UNIVERSITY, CAMBRIDGE, MA - "The Harvard Celebration - New Harvard." 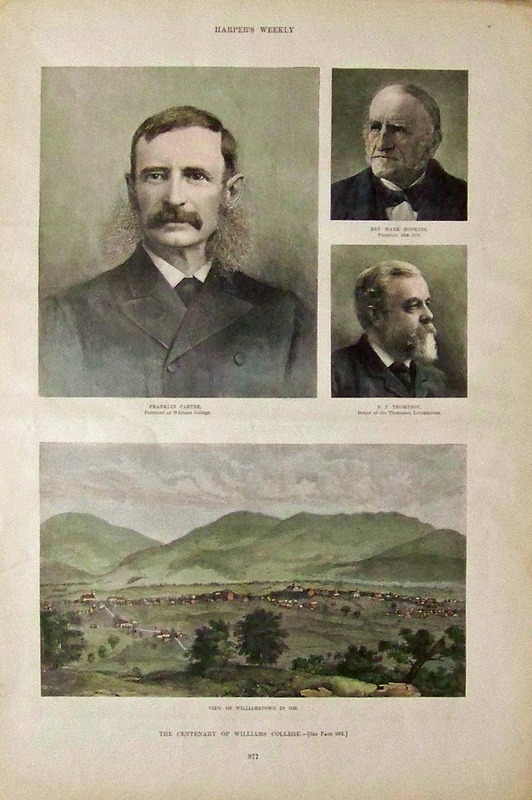 1886 Hand colored engraving. 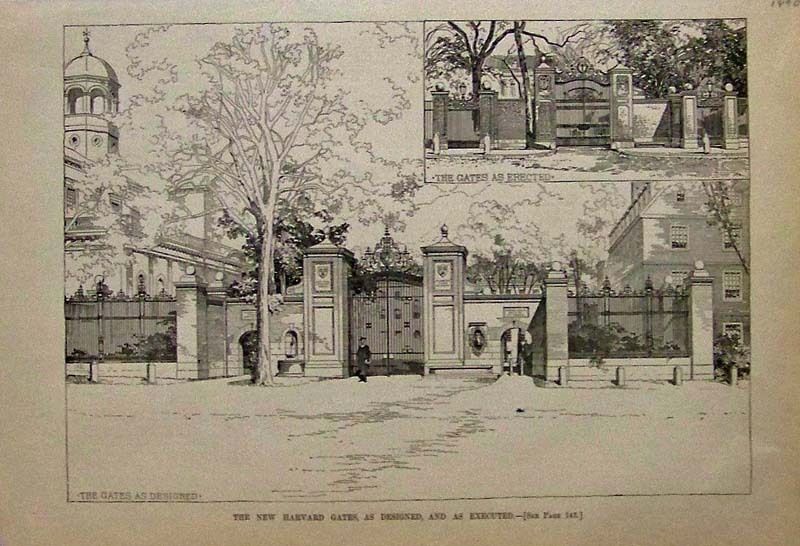 HARVARD UNIVERSITY, CAMBRIDGE, MA -- 1890 The New Harvard Gates, As Designed, and as Executed. 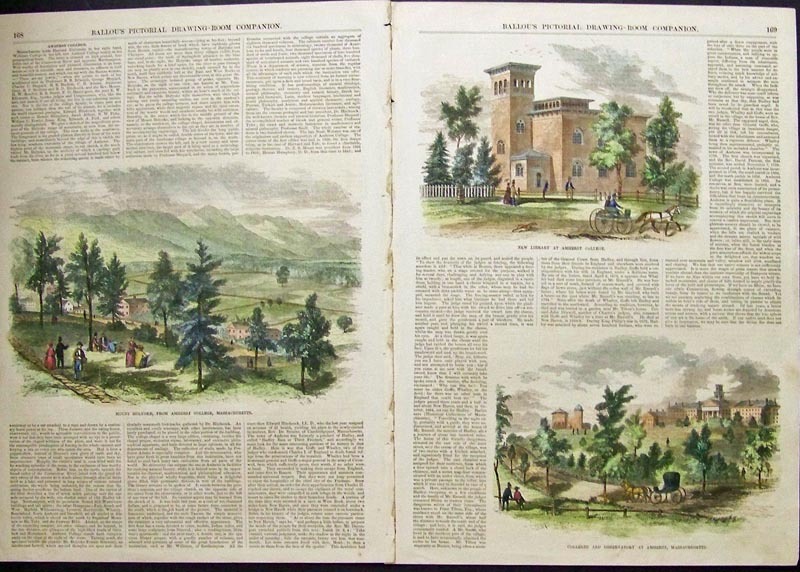 Wood engraving. 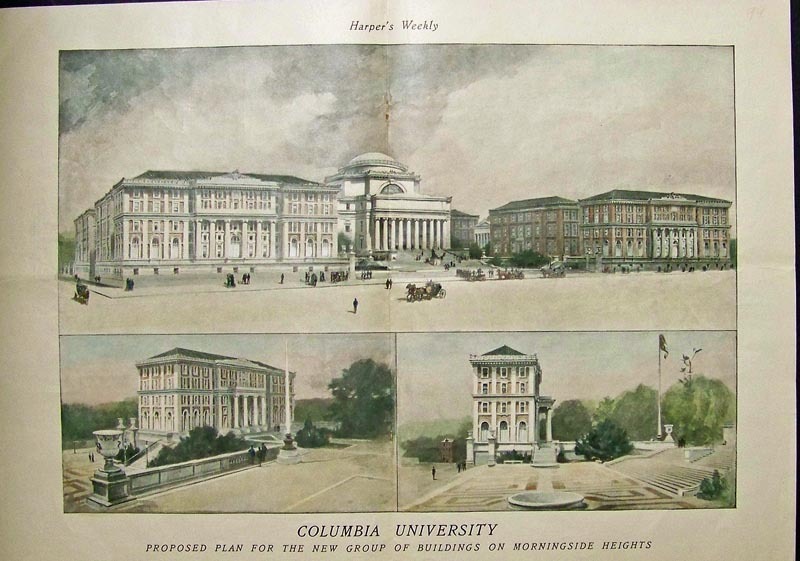 1901 Double-page hand colored half-tone featured in Harper's Weekly showing "Columbia University -- Proposed Plan for the New Group of Buldings on Morningside eights." 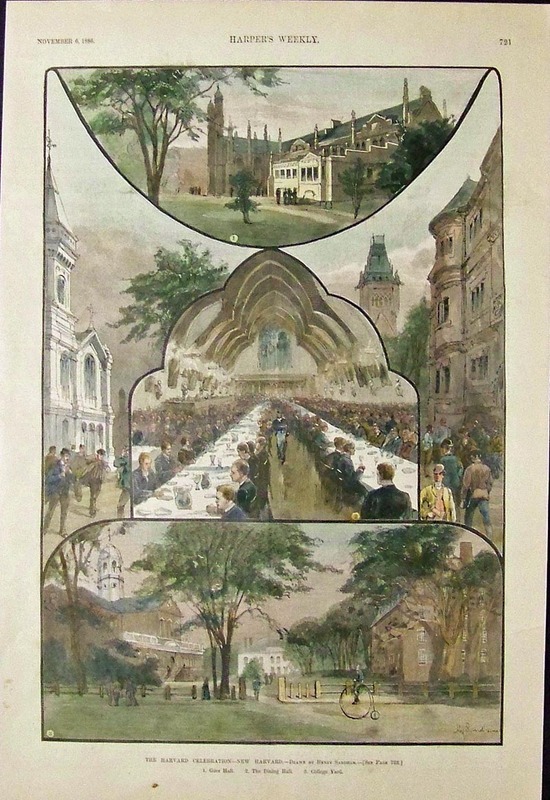 LEHIGH UNIVERSITY, BETHLEHEM, PA - 1885 Hand colored engraving. 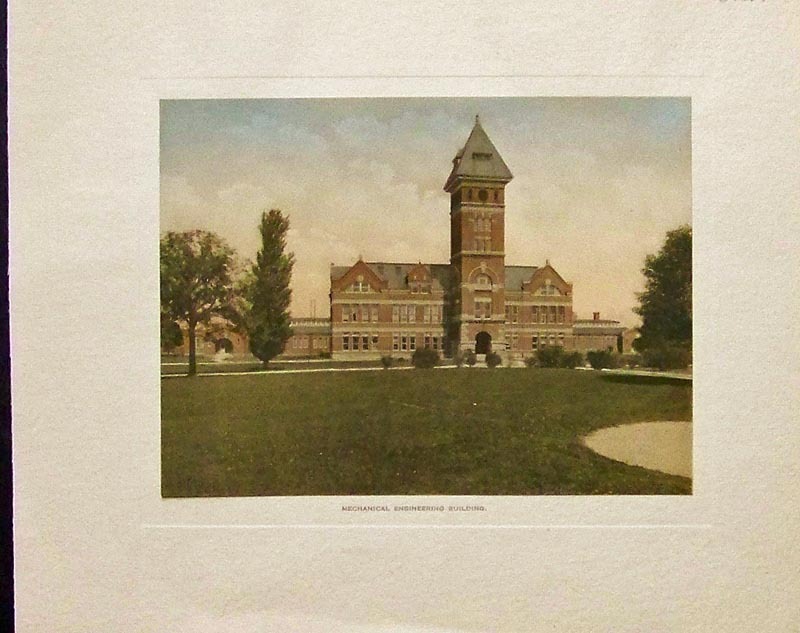 UNIVERSITY OF MICHIGAN, AT ANN ARBOR - 1887 Large hand colored engraving. 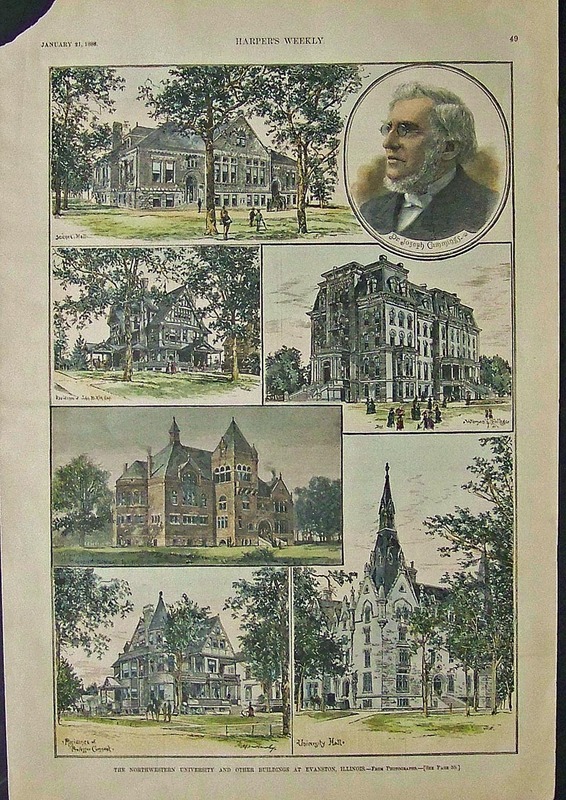 UNIVERSITY OF MINNESOTA - 1887 Hand colored engraving. 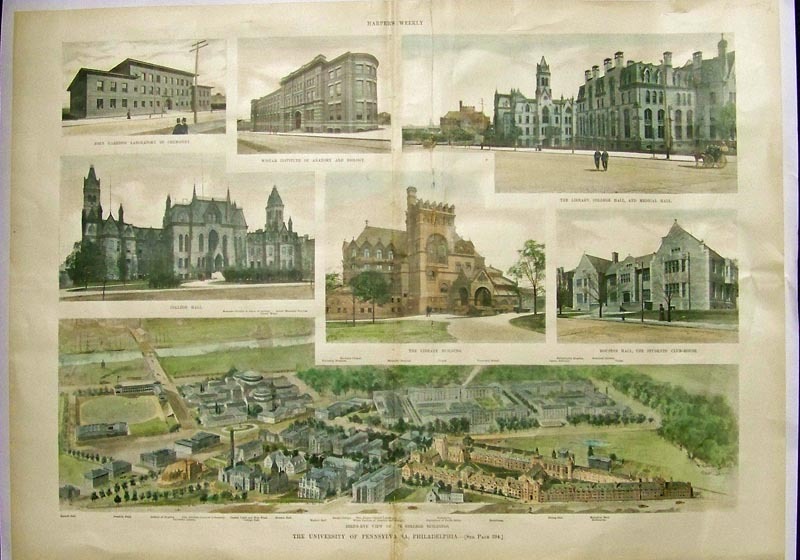 UNIVERSITY OF THE CITY OF NEW YORK - 1895 Hand colored half-tones. 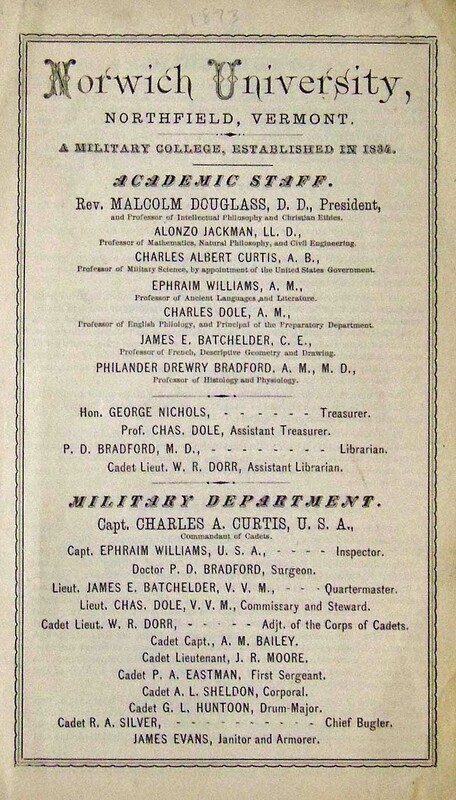 of Cadets from that era. 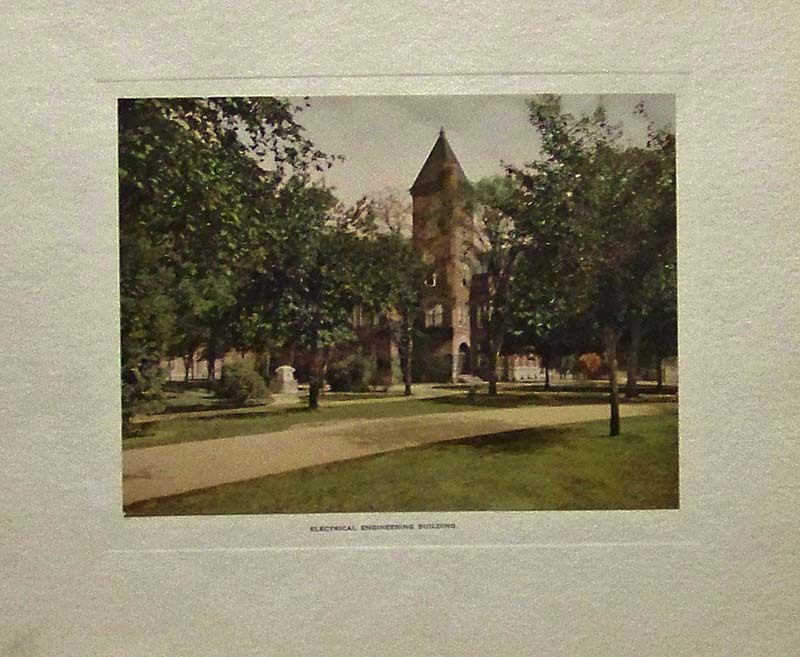 OBERLIN COLLEGE, OBERLIN, OH. 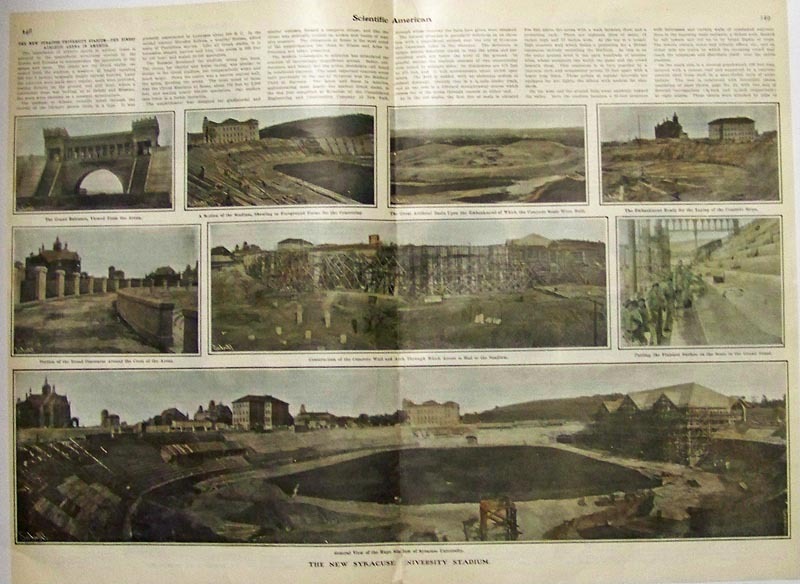 - 1887 Hand colored engraving. 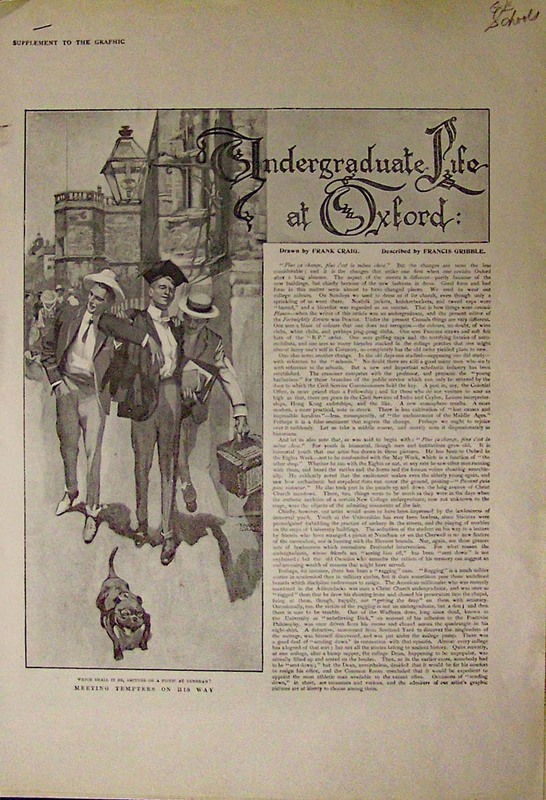 OXFORD - Supplement to The Graphic article with images on the Undergraduate Life at Oxford. 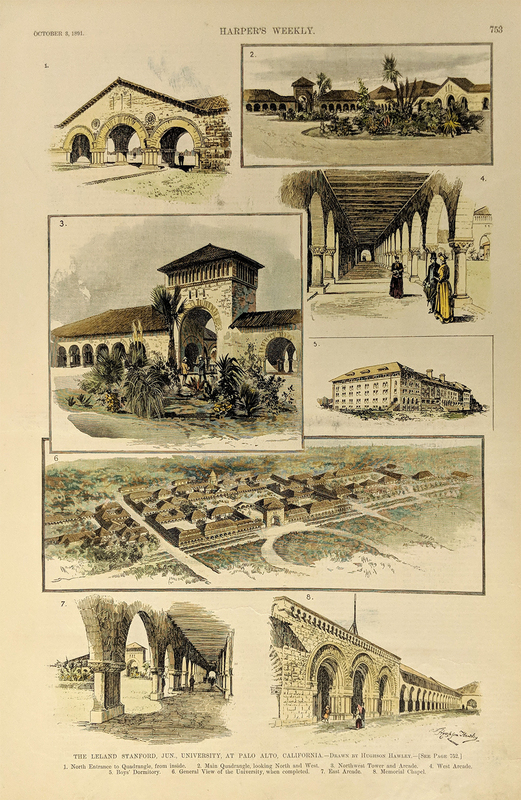 Four versa pages of images and text. 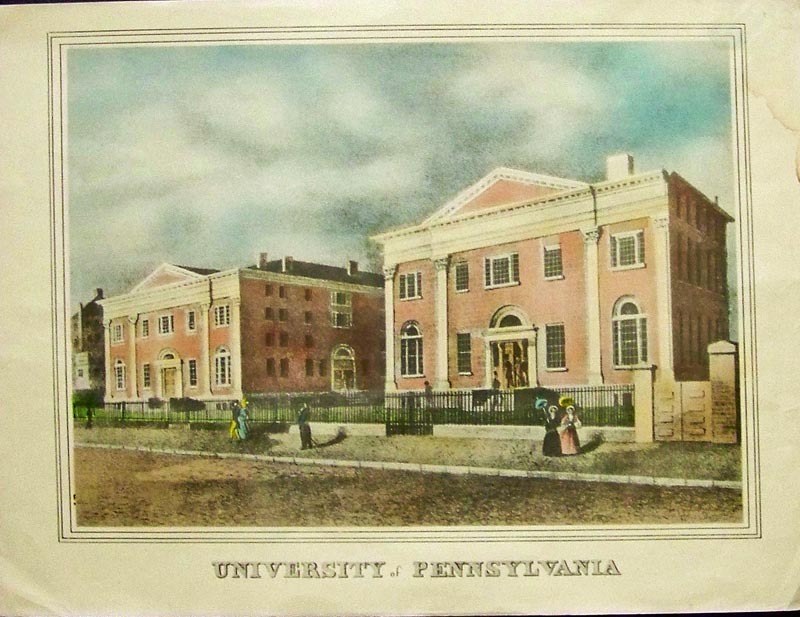 UNIVERSITY OF PENNSYLVANIA - 1920 Color lithograph. 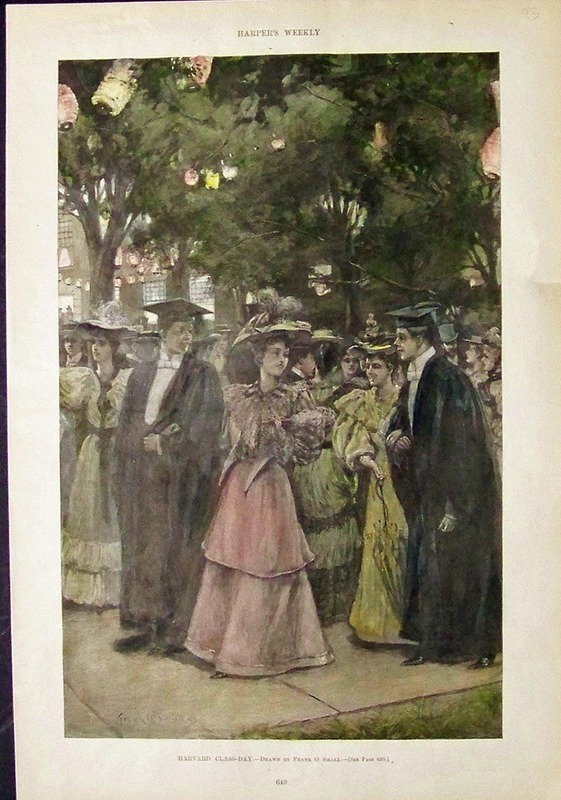 UNIVERSITY OF PENNSYLVANIA - Washington's Birthday Celebration. 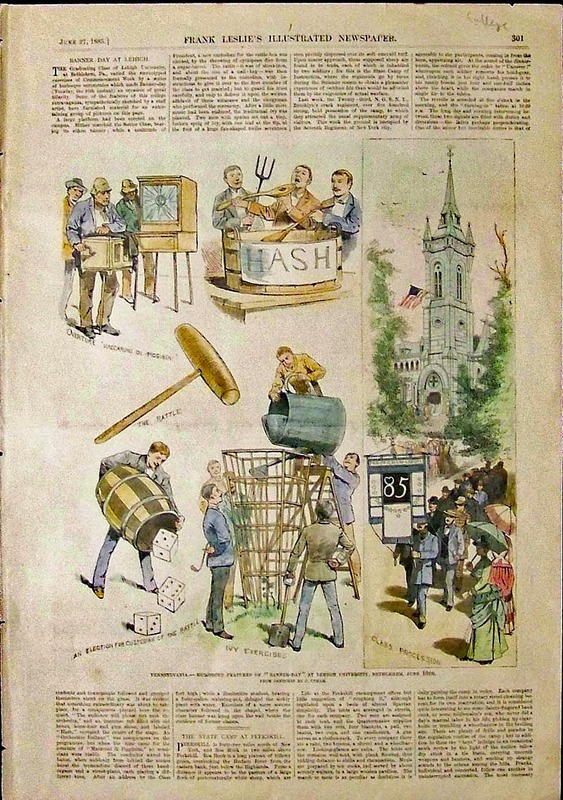 1898 Hand colored half-tone. 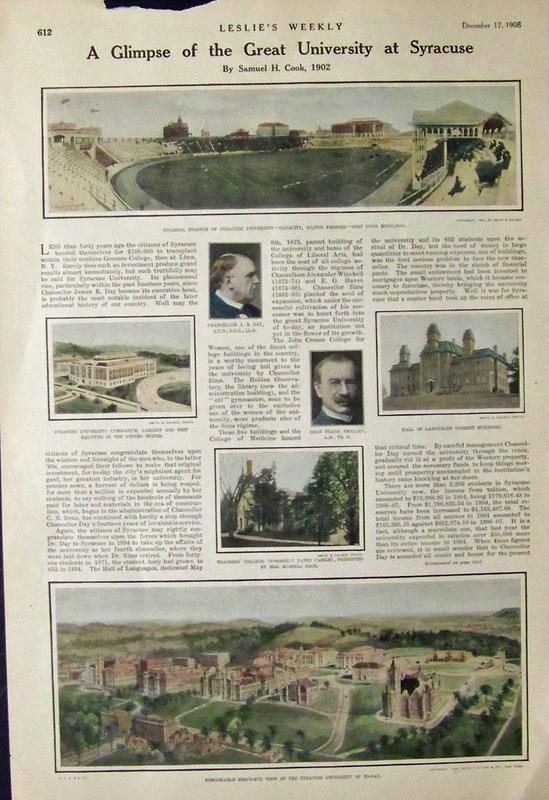 PRINCETON UNIVERSITY - Football. 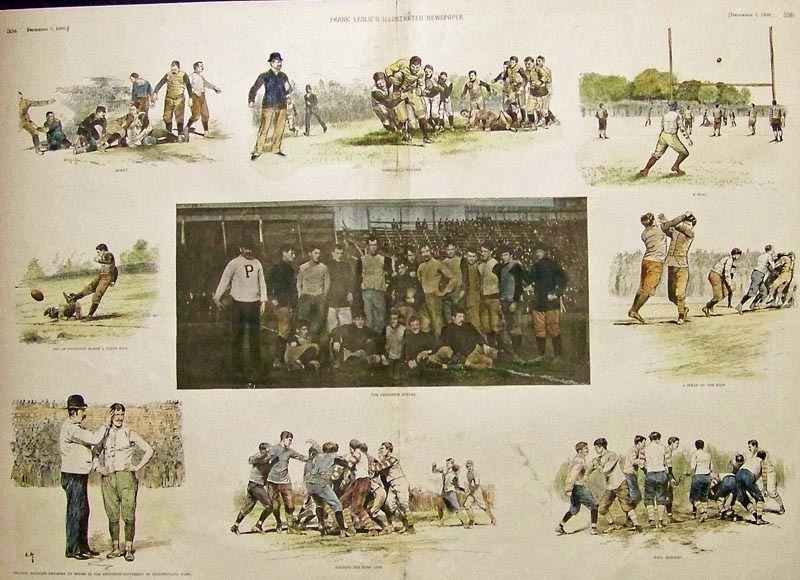 1890 Hand colored. 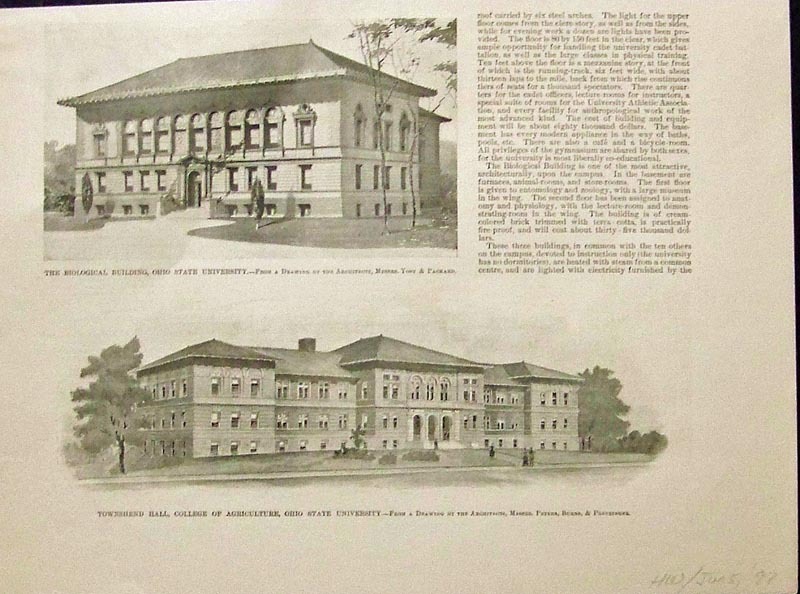 PRINCETON UNIVERSITY, NJ - Biology Department. 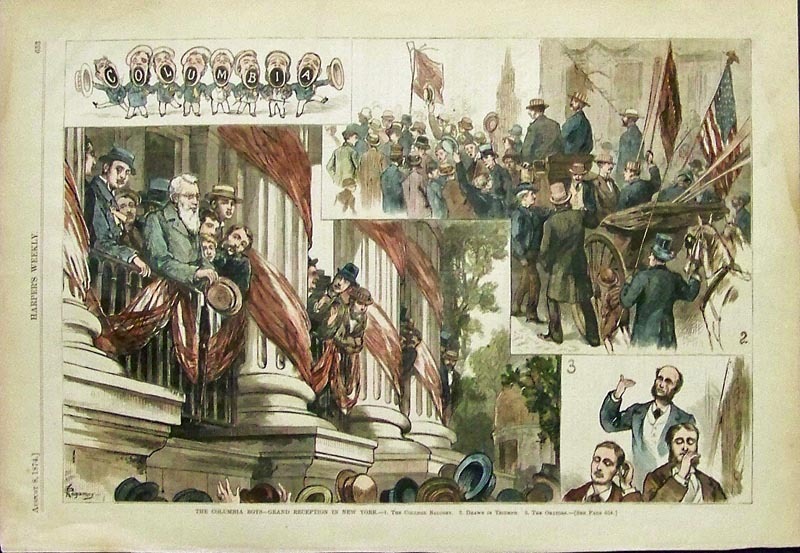 1881 Hand colored engraving. 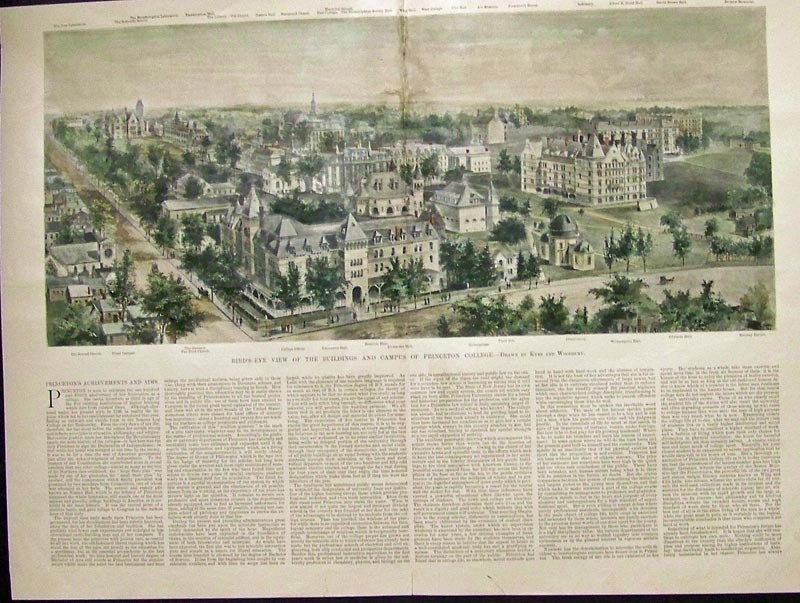 PRINCETON UNIVERSITY, NJ - Great bird's-eye view. 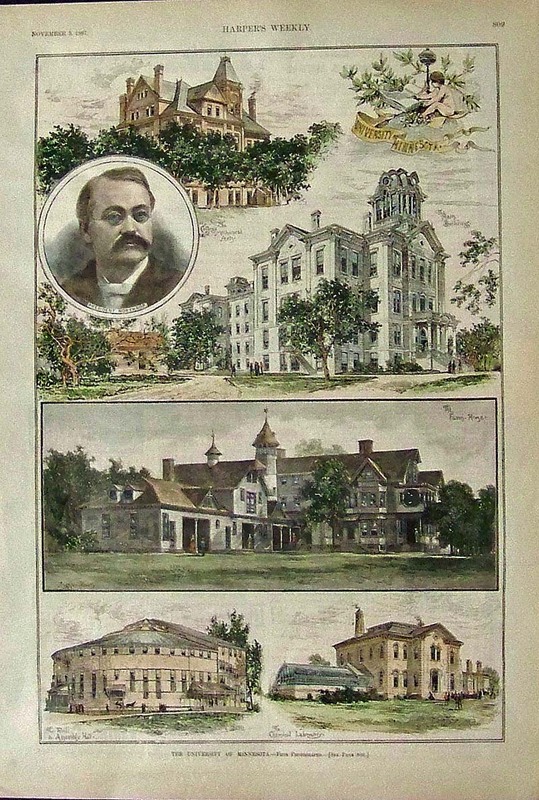 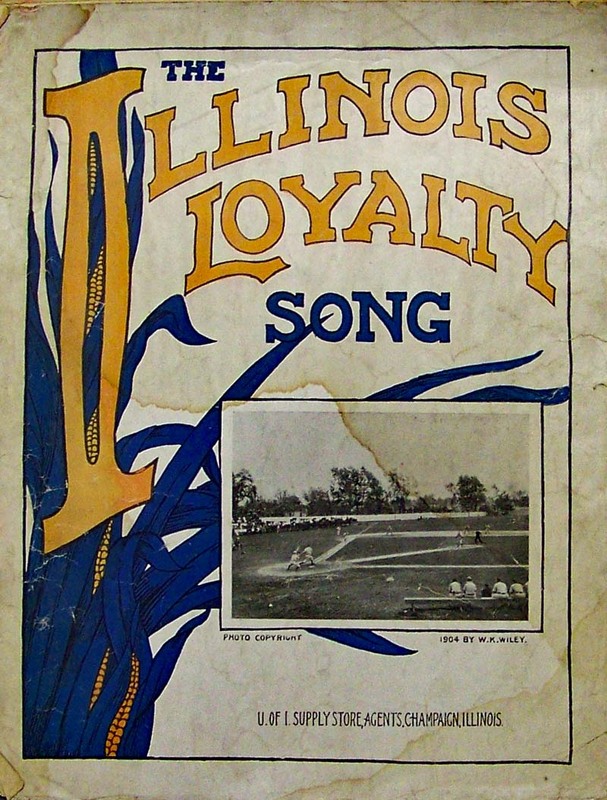 1896 hand colored half-tone with text. 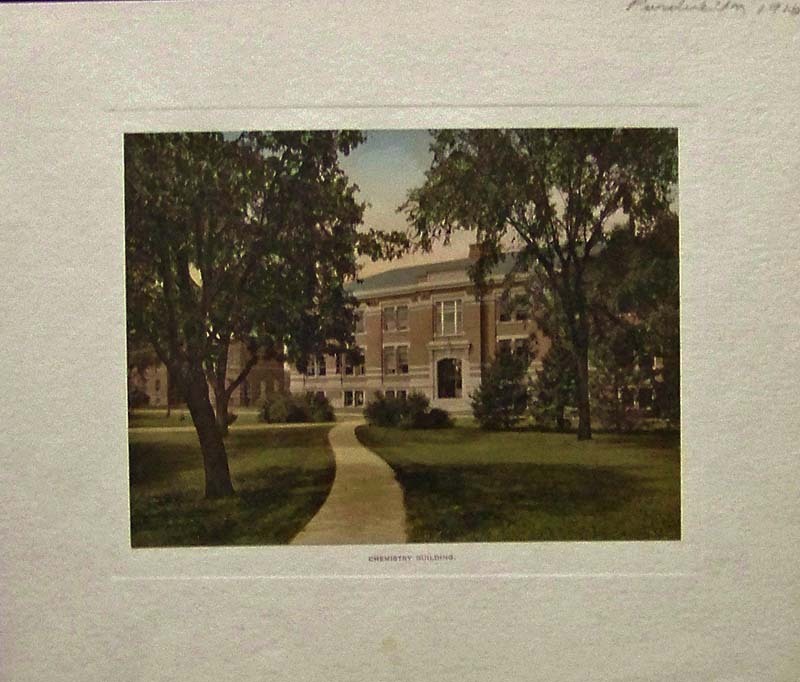 PURDUE UNIVERSITY, IN - Stanley Coulter Hall. 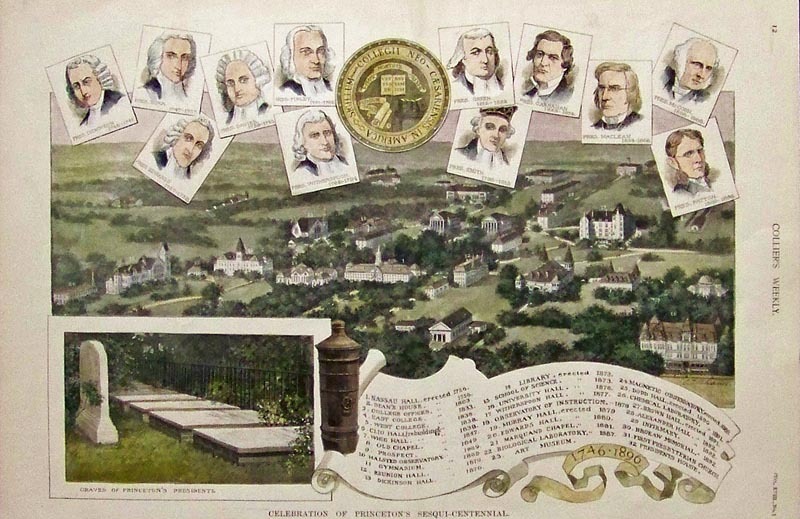 1915 Color lithograph. 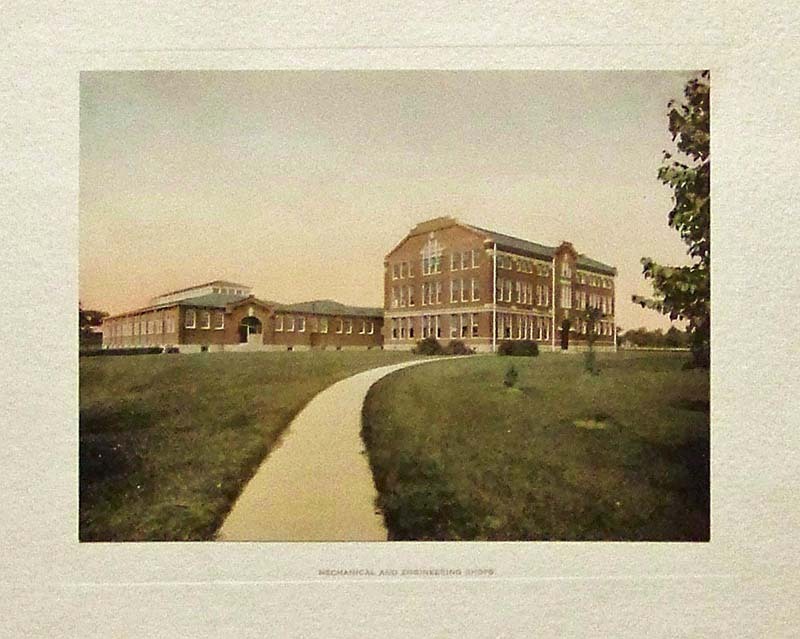 PURDUE UNIVERSITY, IN - Mechanical Engineering Building. 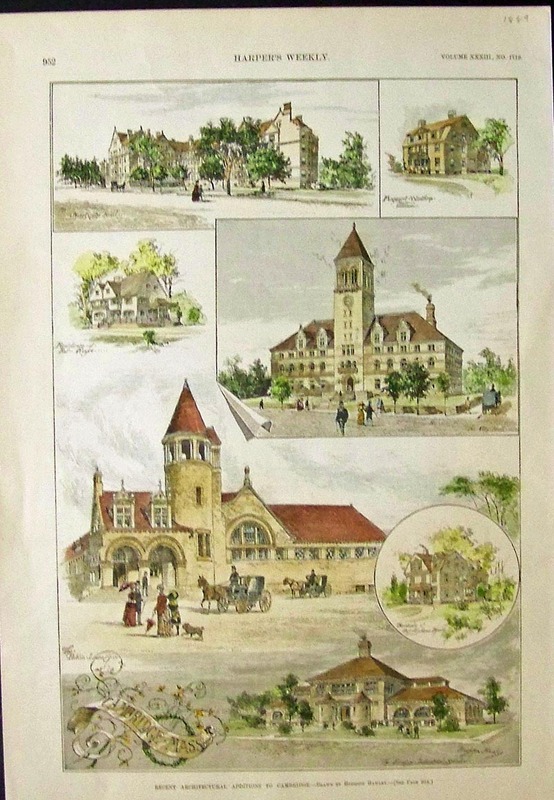 1915 Color lithograph. 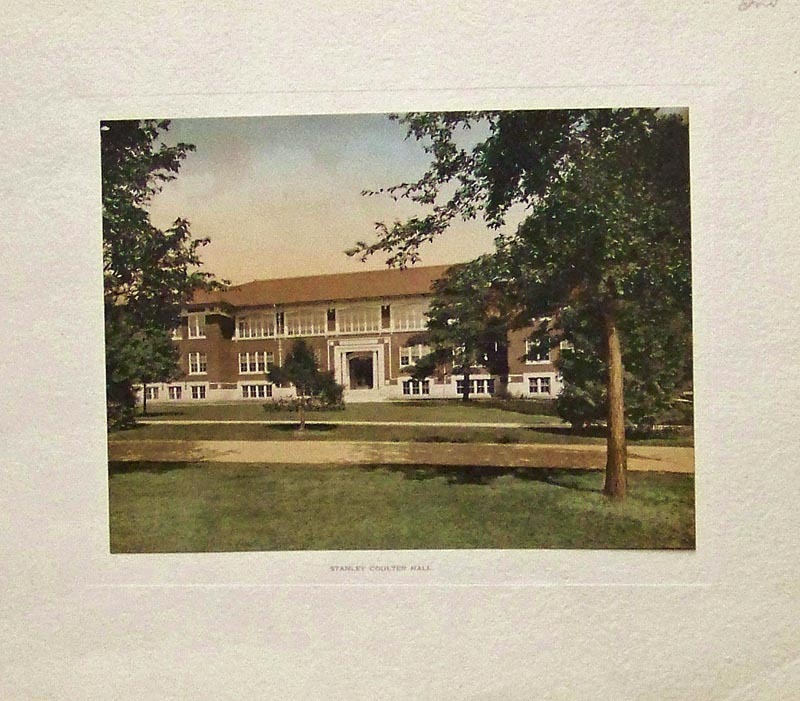 PURDUE UNIVERSITY, IN - 1915 Color lithograph of the Main Hall. 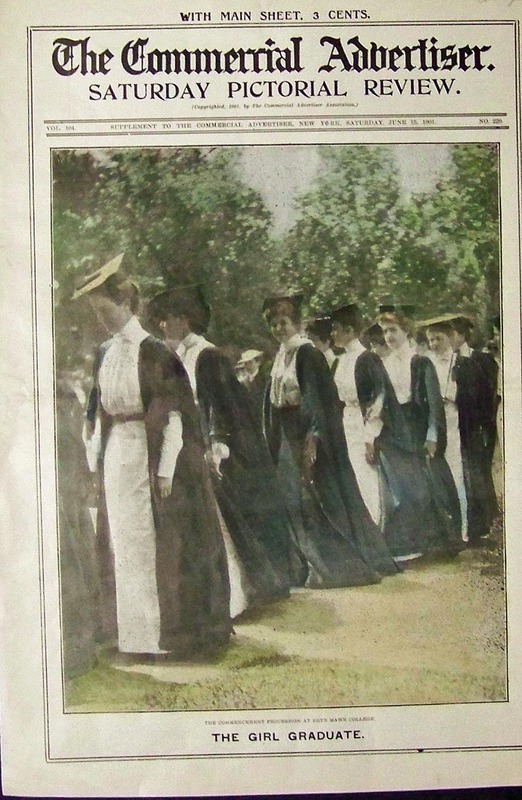 C.1900 Very Rare. 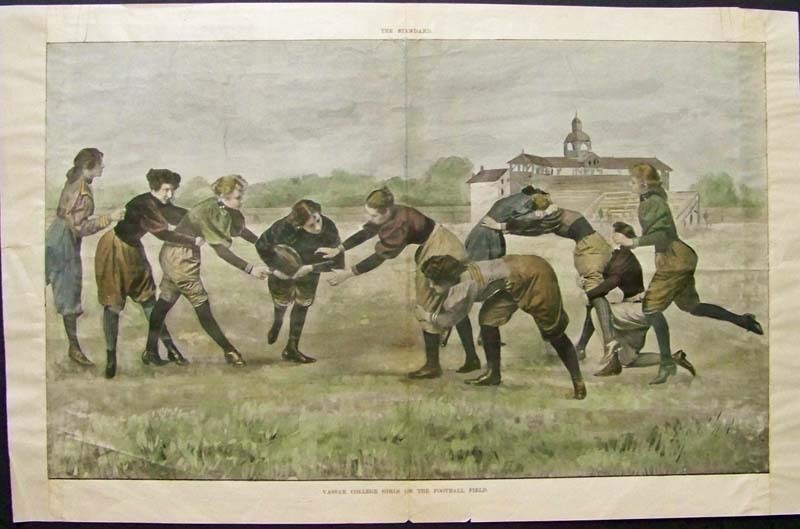 "Vassar College Girls On the Football Field." 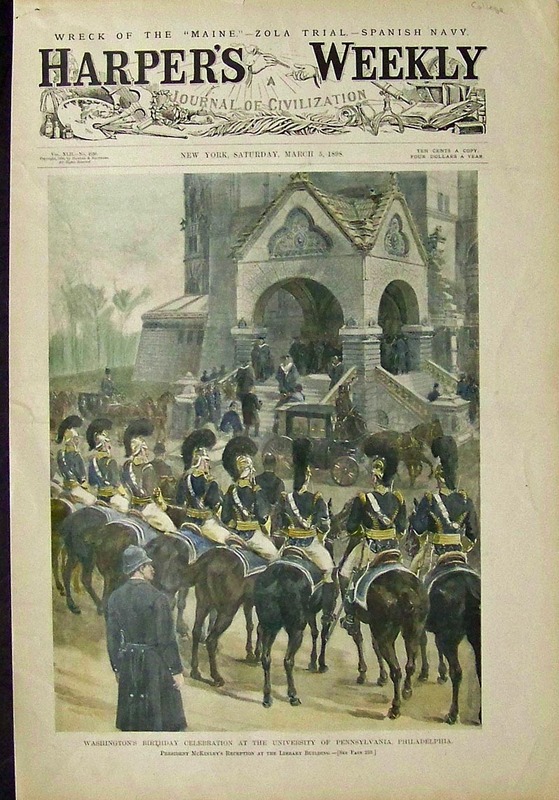 This hand colored half-tone was featured in The Standard and has been repaired archivally. 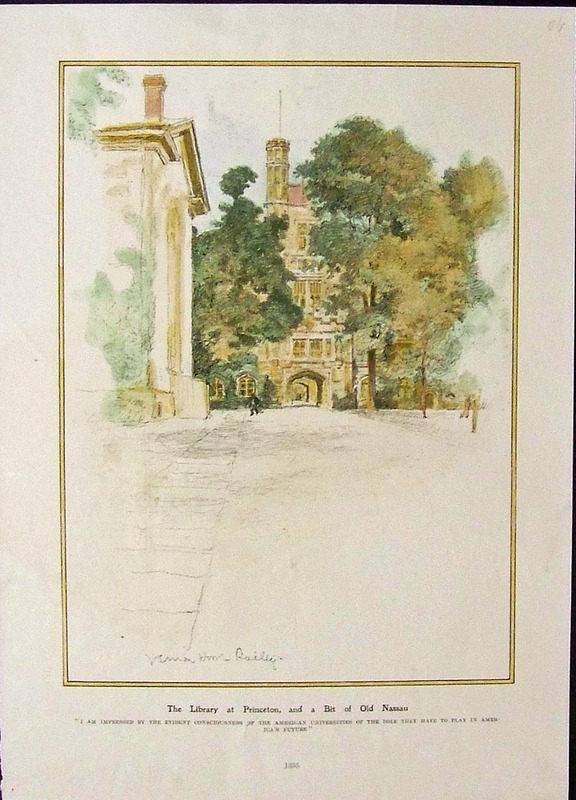 Color lithograph of the Purdue Gates. 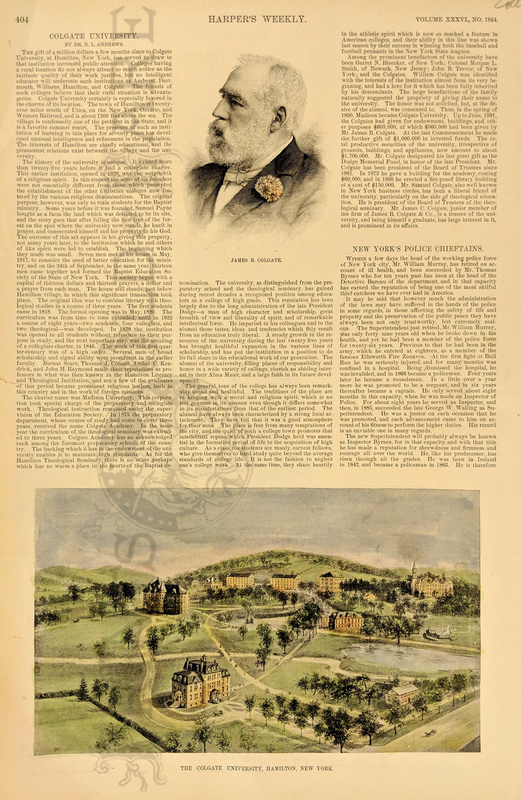 1888 Senator Stanford’s farm at Palo Alto. 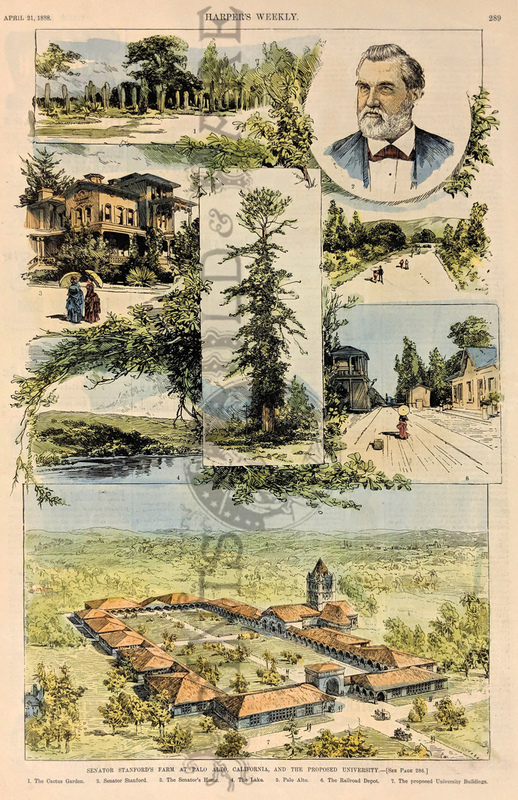 7 early views including proposed campus and the tree “Palo Alto.” Hand colored, wood engraving. 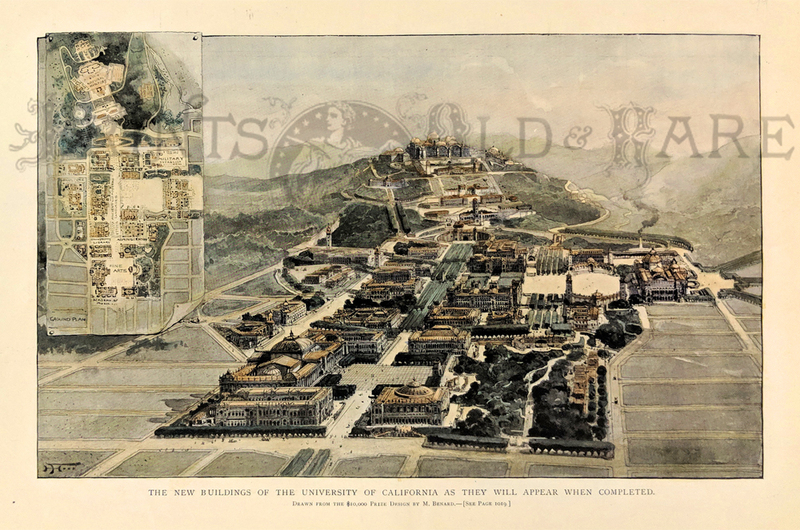 UNIVERSITY of CALIFORNIA 1899 Hand colored half-tone of buildings under construction drawn from the $10,000 Prize Design by M. Benard. 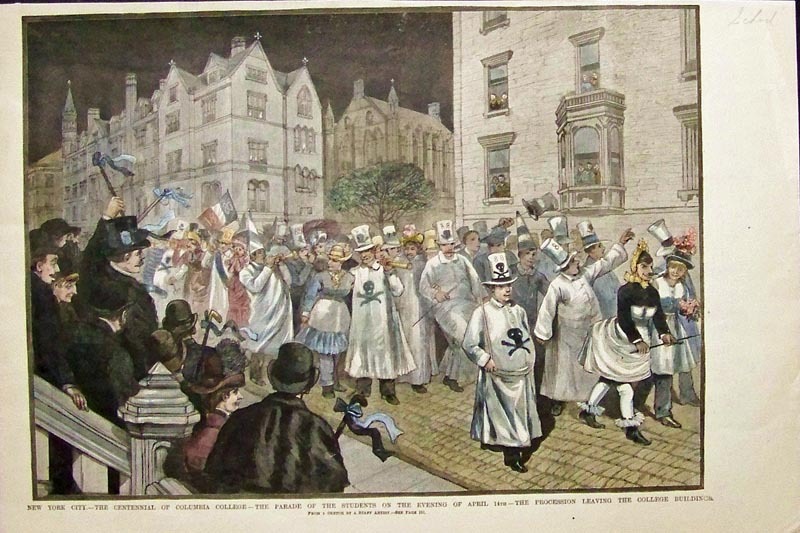 The Harvard Celebrations -- Old Harvard. 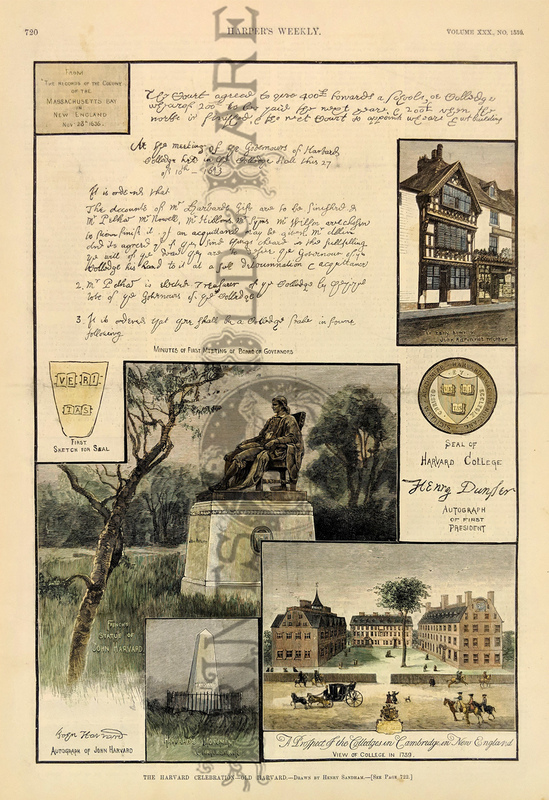 Vignettes showing Minutes of the First Meeting of Board of Governors, the early home of John Harvard's mother, the Seal of Harvard College, and autograph of the First President, French's Statue of John Harvard, and a View of the College in 1739. 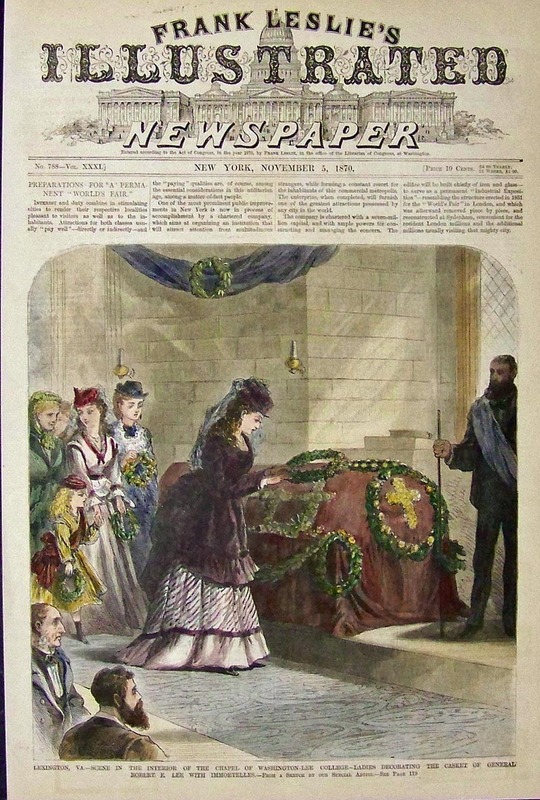 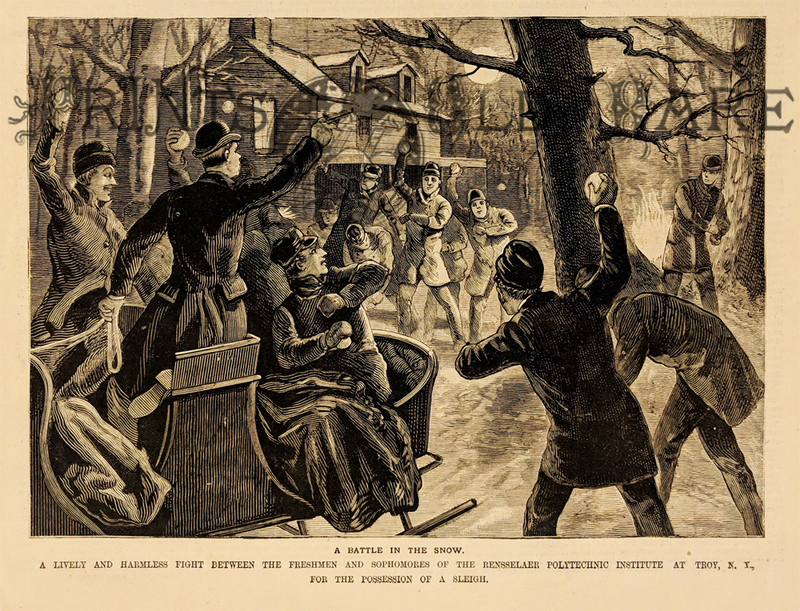 1886 Harper's Weekly. 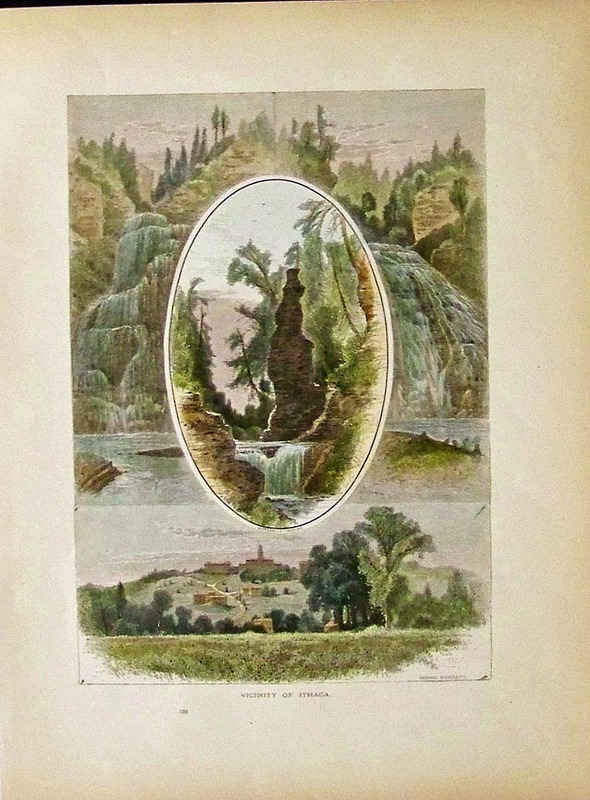 Hand colored, wood engraving. 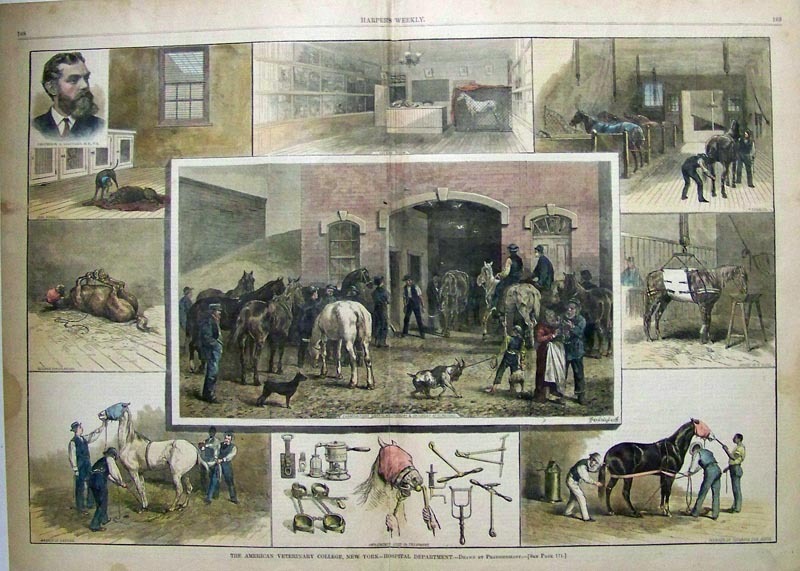 Color lithograph of the Mechanical and Engineering Shops. 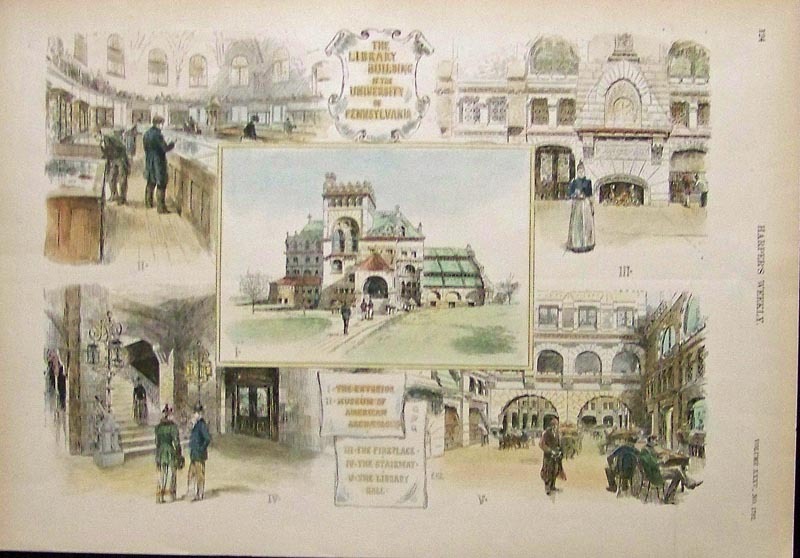 Color lithograph of the Gymnasium. 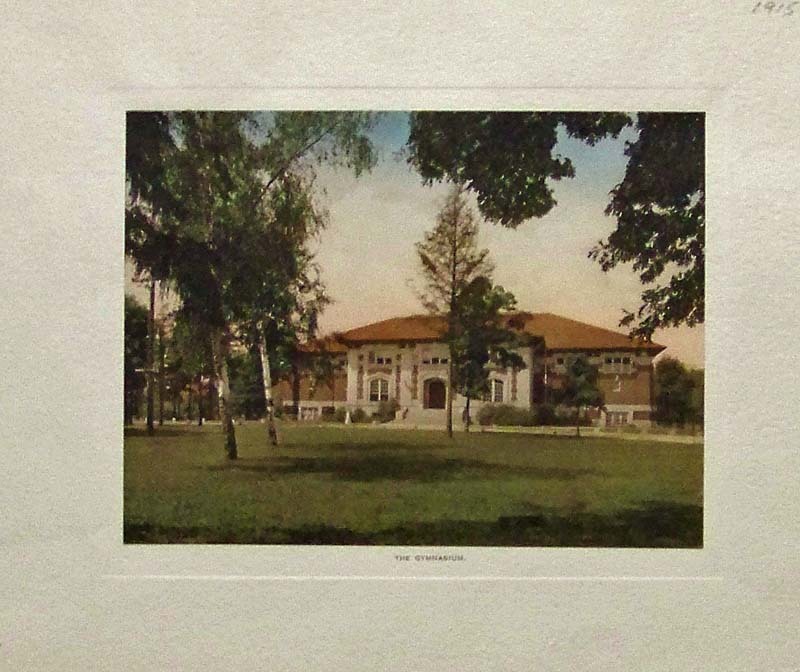 Color lithograph of the Electrical Engineering Building. 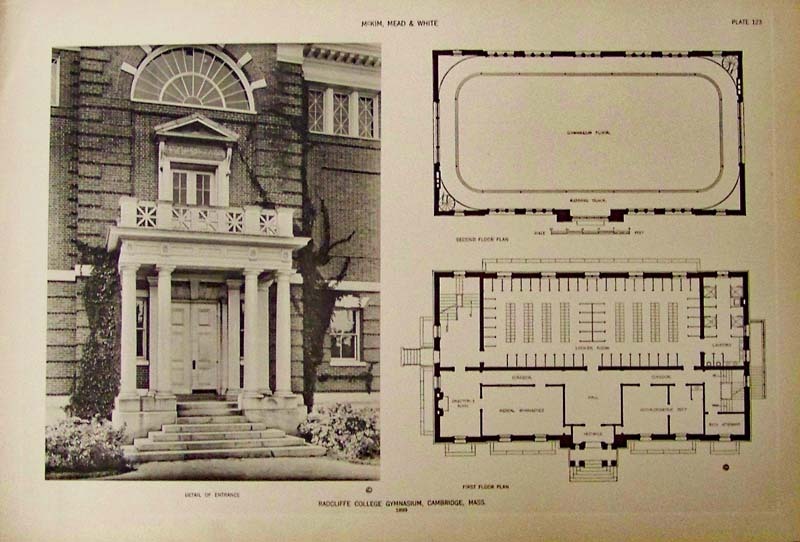 1899 RADCLIFFE COLLEGE, Gymnasium, published by McKim, Mead & White. 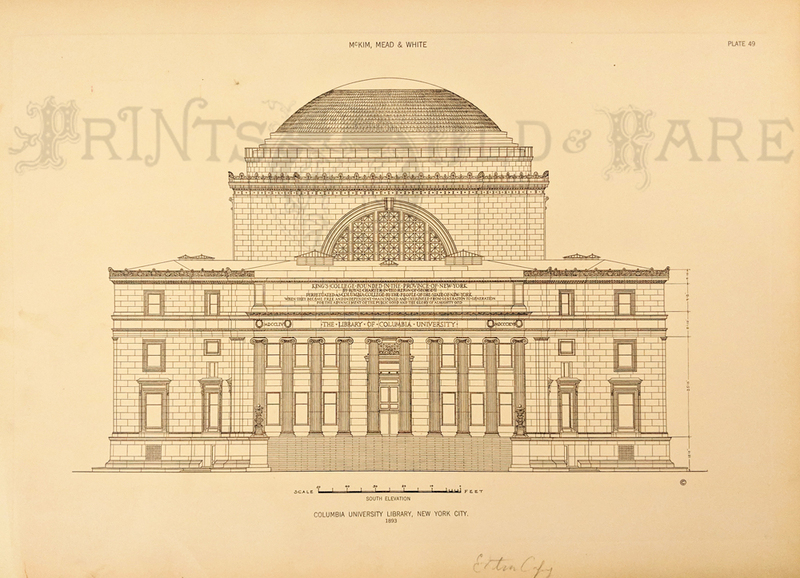 Photo shows entrance and Chematic Plan. 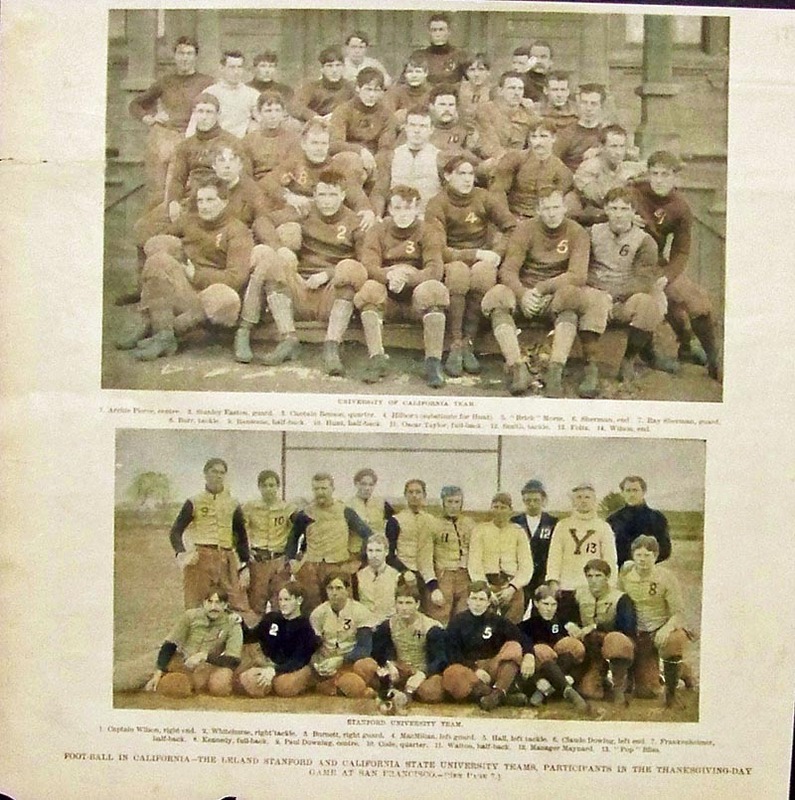 SYRACUSE UNIVERSITY, NY - 1908 Hand colored half-tones with text. 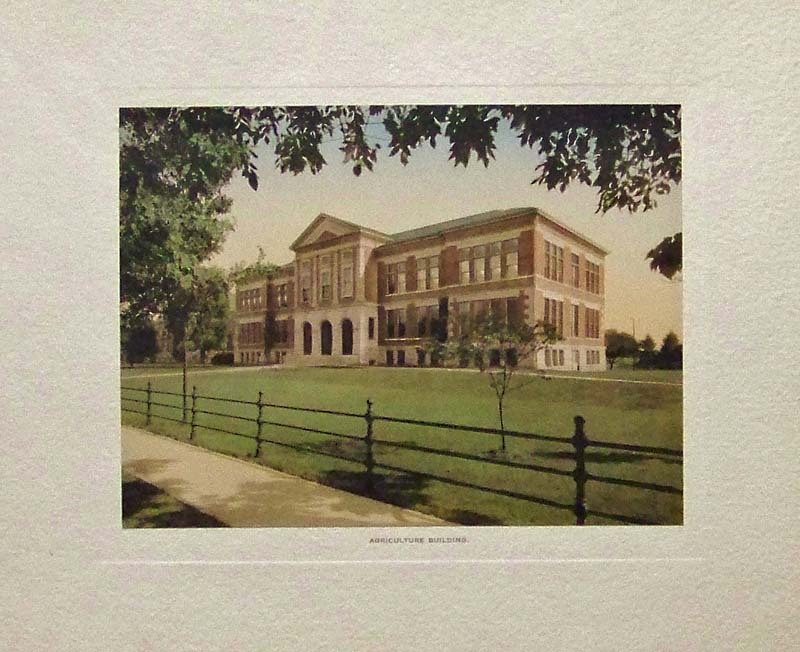 UNION COLLEGE, SCHENECTADY, NY - 1894 Hand colored half-tones. 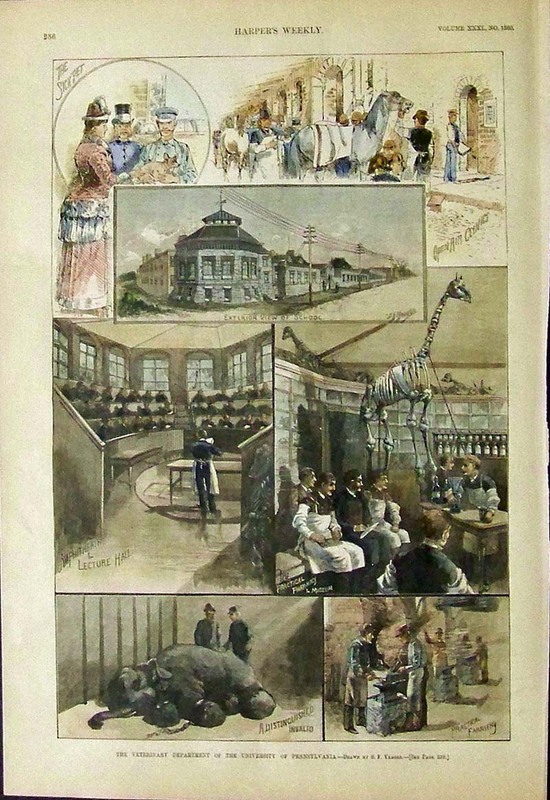 AMERICAN VETERINARY COLLEGE, NY - 1881 Large hand colored wood engraving. 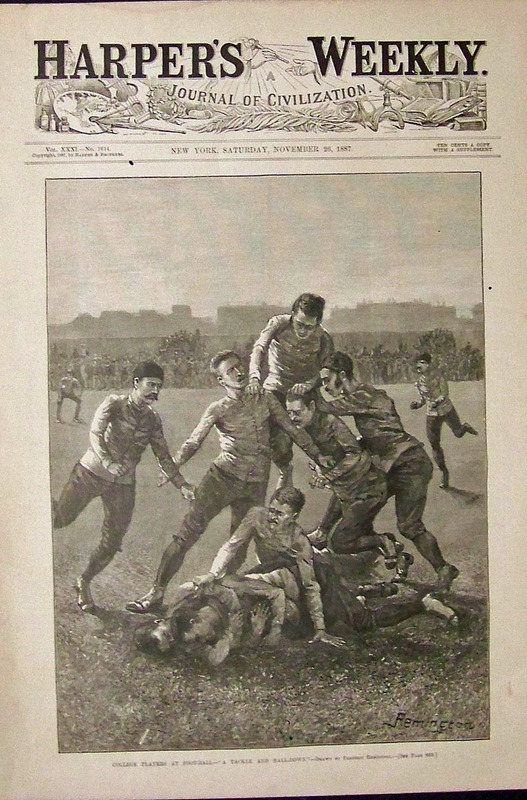 YALE UNIVERSITY, NEW HAVEN, CT - Frederic Remington Football black and white wood engraving. 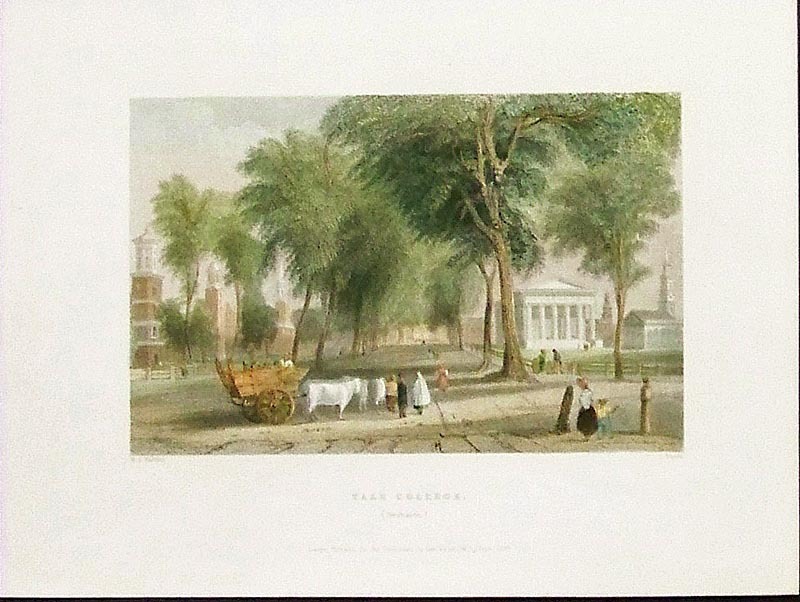 YALE UNIVERSITY, NEW HAVEN, CT - Bicentennial. 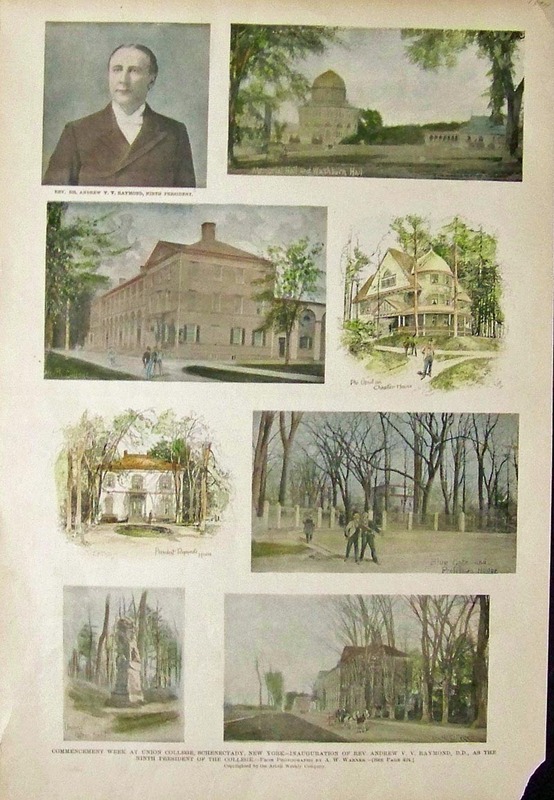 1901 Hand colored half-tone views. 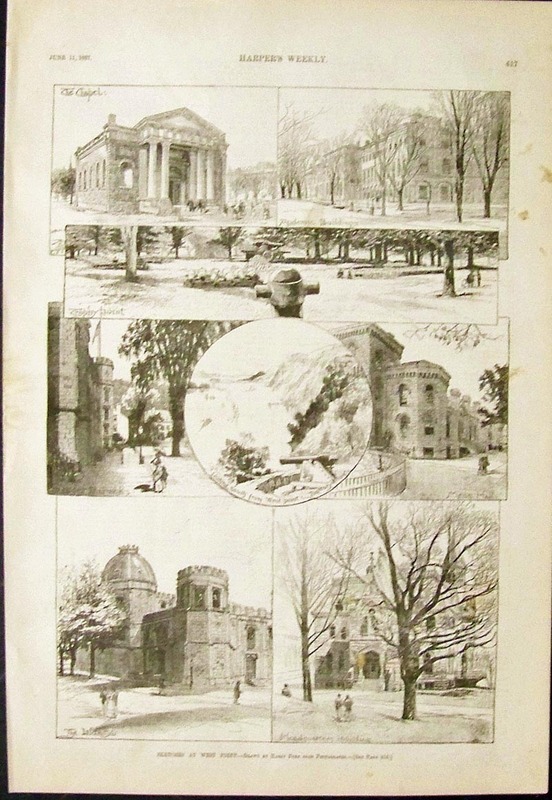 YALE UNIVERSITY, NEW HAVEN, CT - Yale College and State House steel engraving. 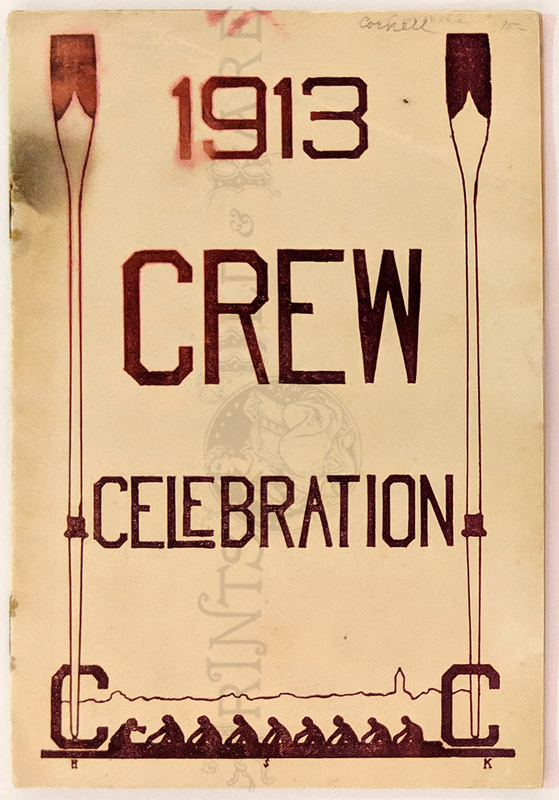 With mat. 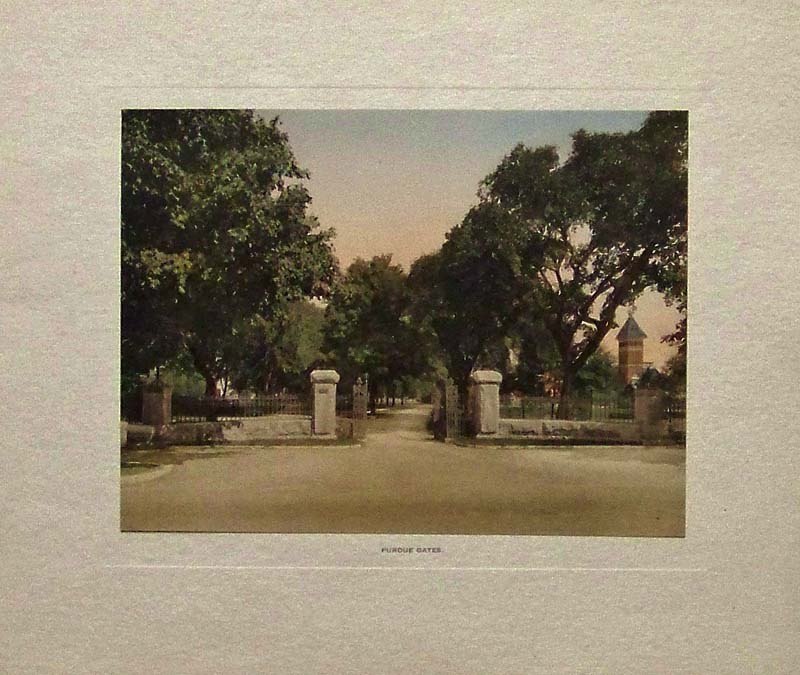 YALE UNIVERSITY, NEW HAVEN, CT - Hand colored half-tone showing the Most Spectacular Feature of the Yale Bi-Centennial Celebration. 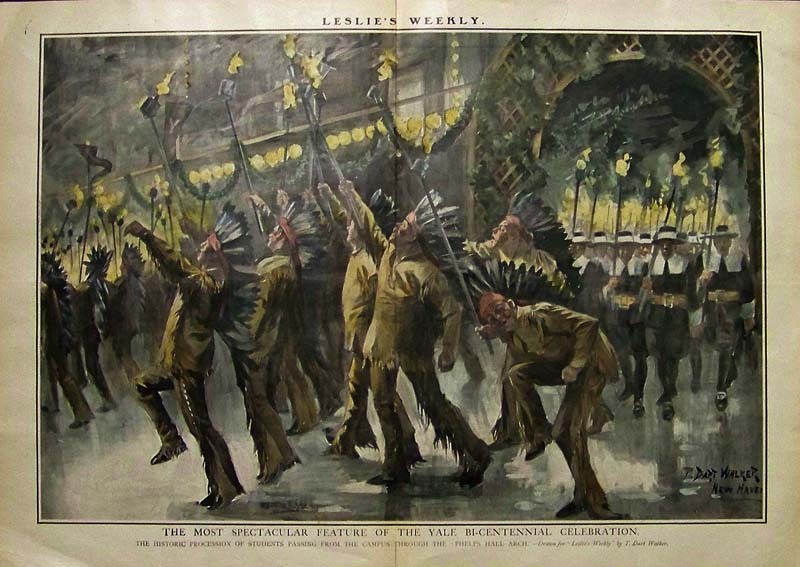 Featured in Leslie's Weekly by T. Dart Walker. 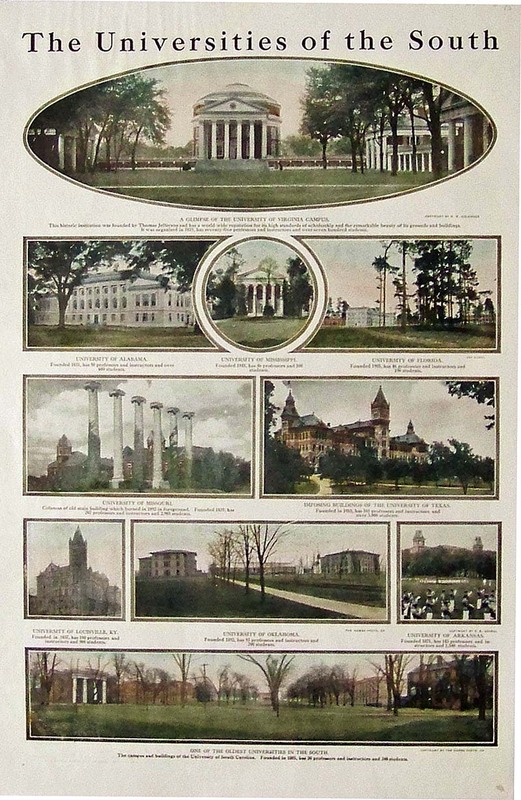 1915 Hand colored half-tones - The Universities of the South. 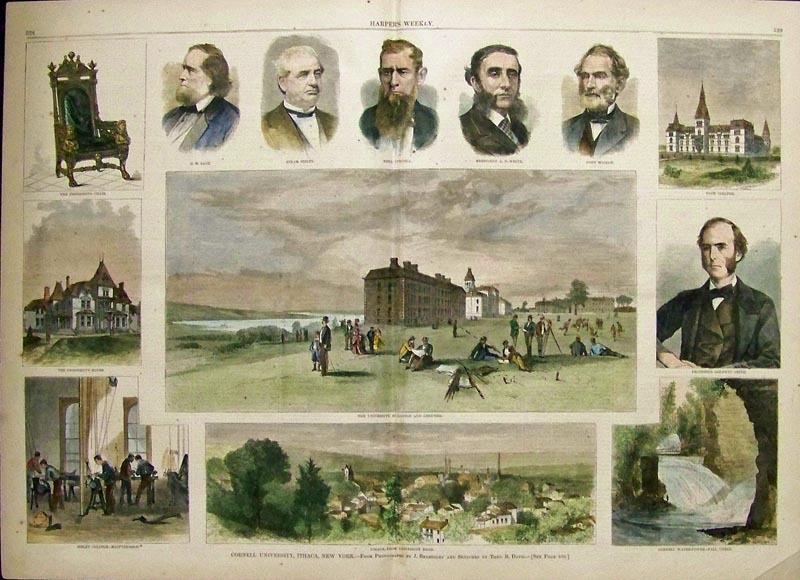 Each half-tone depicts a different university in the south, from The University of South Carolina, one of the oldest universities in the south to The U. of Oklahoma, Mississippi, Texas, Louisville, KY., Alabama, Florida, Texas and others.